Steven A. Camarota is Director of Research at the Center for Immigration Studies. He holds a Ph.D. in Public Policy Analysis from the University of Virginia. Dr. Camarota has testified before Congress and written extensively on the effects of low-skilled immigration on American workers. Why Care About Poverty Caused by Immigration? Figure 1: The poverty rate for persons in immigrant households has grown dramatically since 1979. Figure 2: The total poor population accounted for by persons in immigrant house holds has grown dramatically since 1979. Most examinations of poverty in the United States have typically focused either on how broad economic trends and social welfare policy affect the size of the population living in poverty or the socio-demographic characteristics of those in poverty. Almost no research has examined immigration's impact on the incidence of poverty in the United States. This report looks at the composition of persons living in poverty in 1979, 1989, and 1997 in order to evaluate the effect of immigration policy on the size and growth of the poor population (poor and poverty are used synonymously). The findings indicate that despite a strong economy over much of this period, the poverty rate for persons in immigrant-headed households not only has remained high, but actually has increased significantly in the last two decades. As a result, immigration has become a major factor in the size and growth of poverty. The gap between immigrant and native poverty almost tripled in size between 1979 and 1997. The poverty rate for persons living in immigrant households grew dramatically, from 15.5 percent in 1979 to 18.8 percent in 1989 and to 21.8 percent in 1997, while over the same period the poverty rate for persons in native households stayed relatively constant at roughly 12 percent. In 1997, more than one in five persons (21.6 percent) living in poverty resided in an immigrant household. And nearly one in four children in poverty now lives in an immigrant household. In comparison, only 9.7 percent of the poor lived in immigrant households in 1979. The growth in immigrant-related poverty accounted for 75 percent (3 million people) of the total increase in the size of the poor population between 1989 and 1997. This increase is enough to entirely offset the 2.7 million reduction in the size of the poor population that results from the $64 billion spent annually on means-tested cash assistance programs. Immigration is one of the primary factors causing the nation's overall poverty rate and the number of people living in poverty to be higher today than they were 20 years ago. If immigrant-headed households are excluded, the total number of people in poverty in 1997 and the nation's poverty rate would have been only slightly higher than it was in the late 1970s. This rise in immigrant-related poverty was caused partly by an increase in the poverty rate for each wave of new arrivals. In 1979, the poverty rate for persons living in households headed by an immigrant who arrived in the ten year prior was 23 percent; by 1997, the poverty rate for individuals in households headed by a new immigrant had increased to 29.2 percent. The increase in immigrant-related poverty was also caused by a slowing in the pace of progress immigrants make in moving out of poverty over time. For example, the poverty rate for immigrant households who arrived in the 1980s was still over 25 percent in 1997 — double that of natives. The increase in the poverty rate for immigrant households in the 1990s was very broad, affecting persons with different levels of education and individuals in and out of the labor force, as well as households from most parts of the world. The rise in the poverty rate was particularly large for children in immigrant households, increasing from 24.8 to 30.9 percent. The gap in the poverty rate for persons in immigrant and native households widened in every region of the country and in almost every major metropolitan area during the 1990s. The poverty rate varies significantly by region of origin. Immigrants from Mexico, the Caribbean, and Central America have the highest poverty rates, while those from Europe and Asia tend to have the lowest. In addition to an increased likelihood of living in poverty, people in immigrant households are also more likely to be near-poor. In 1997, 13.4 percent of persons in immigrant households had incomes that were only 50 percent above the poverty line compared to 8.6 percent of natives. In total, 35.2 percent or 12.4 million persons in immigrant households live in or near poverty. The high poverty rate associated with immigrants is primarily explained by their much lower levels of education, higher unemployment, and larger family size. However, even after controlling for a wide variety of factors, including race, age, family structure, and education, statistical analysis indicates that persons in immigrant households are still significantly more likely to be living in poverty than individuals in native households. Welfare reform does not seem to have caused the rise in immigrant poverty. Immigrant poverty was increasing well before 1996, when Congress curtailed benefits to legal immigrants. Moreover, the gap between the poverty rate for people living in immigrant and native households has actually narrowed slightly since welfare reform was enacted. The rise in immigrant poverty was not caused by an increase in the recency of the immigrant population. Since newly arrived immigrants tend to have higher poverty rates than those who are more established, an increase in the proportion of persons living in households headed by a newly arrived immigrant might account for the rise in poverty. However, this is not the case. Households headed by new arrivals account for a smaller share of the total population living in immigrant households in 1997 than in 1979. The high poverty rate associated with immigrants is not explained by the presence of illegal immigrants. Although their poverty rate is high, illegal aliens comprise only an estimated 22.5 percent of persons in immigrant households living in poverty in 1997. Why Care About Immigration's Impact on Poverty? Probably the most obvious reason for concern about immigration's impact on the incidence of poverty in the United States is the effect on the poor already here, both native and immigrant. The cost of means-tested programs designed to help the poor depends in large part on the number of people who are eligible to receive benefits and services. If immigration increases the number of people who are in need of assistance, then this can only raise the cost of such efforts and undermine political support for programs that already are unpopular. Alternately, if overall government expenditures on programs for the poor are kept constant, each recipient's benefit must be reduced so that all can be covered. Therefore, if one is concerned about the poor already here, increasing the number of people in or near poverty through immigration is clearly counter-productive. Because of their very low incomes and the progressive nature of most taxes, individuals in poverty pay very little in taxes. Not surprisingly, they also tend to use a great deal of services provided by the government, especially means-tested programs. As a result, they are, almost without exception, a net drain on public coffers. If immigration increases the size of the poor population, then this is very likely to have a negative effect on the tax base, particularly in those cities and states where most immigrants settle. As well-known political scientist Seymour Martin Lipset has observed, democracies can only really work in societies that are not beset by large-scale poverty and deprivation. Widespread poverty makes it much more difficult to engage in the kind of give and take that is an integral part of the democratic process. Social science research also indicates that the distribution of income has an impact on how people view one another: with more poverty comes less trust and greater suspicion of others. Great disparities in income cannot help but create greater social distance between members of a community and this in turn is likely to have a negative impact on political and social harmony. Moreover, it is well established that children who grow up in poverty are more likely to be involved in illicit activity, have higher teenage pregnancy rates, exhibit lower academic achievement, and suffer from a host of other social problems that are much less common among children who do not grow up poor. The poverty that the children of immigrants experience today is likely to have long-term consequences for them and our nation. In addition to the impact on American society in general, looking at poverty among immigrants is also important because it is one way of evaluating the consequences of current immigration policy. It also gives us a good idea of how immigrants admitted in the future are likely to fare if current policy remains in place. This is particularly important because, without a change in immigration policy, 10 million new immigrants likely will settle permanently in the United States in just the next decade. The success, or lack thereof, of past immigrants is probably the best means we have of predicting how tomorrow's immigrants will do if the same selection criteria continue to be used. In addition to immigration policy, which is concerned with who may come and how many, there is immigrant policy, which deals with how we treat the foreign-born living in the United States. Looking at poverty among immigrants is necessary, whatever immigration policy is adopted in the future, because a large percentage of immigrants and their children already here are living in poverty. Our immigrant policy as well as our anti-poverty efforts must take into account this new reality. What's Different About Poverty Caused by Immigration? In any discussion of poverty resulting from immigration, it is important to remember that immigration is a discretionary policy of the federal government. The federal government determines the size, growth, and characteristics of the foreign-born population by setting the level of legal immigration and by the amount of resources it devotes to controlling illegal immigration. While the government can certainly do things to ameliorate poverty caused by such factors as changes in family structures or the economy, these things are complex social phenomena and are not the direct result of a specific federal policy. In contrast, the poverty that results from immigration is avoidable in a way that is not the case for poverty caused by domestic conditions. The data in this study come primarily from the 1980 and 1990 censuses and the March 1998 Current Population Survey (CPS). The censuses and the CPS are used because they are the best sources of information on persons born outside of the United States — referred to as foreign-born by the Census Bureau. For the purposes of this report, foreign-born and immigrant are used synonymously. The CPS and censuses ask respondents about their income for the previous year. Therefore, as is the case with poverty statistics published by the government, the figures in this analysis from the March 1998 CPS are for 1997 and the figures from the 1980 and 1990 censuses are for 1979 and 1989 respectively. This report examines poverty for persons living in immigrant- and native-headed households. For the purposes of this report, a household is defined in the following manner: Individuals related to the household head by blood, marriage, or adoption, regardless of their own nativity, are considered to be in an immigrant or native household based on whether the head of the household is an immigrant or a native. Individuals unrelated to the head are considered immigrant or native based on their own nativity. Defined in this way, 92.2 percent of the people living in immigrant-headed households were immigrants themselves (67.4 percent) or the native-born child under age 21 (24.8 percent) of an immigrant father or mother in 1998. Therefore, this approach primarily measures poverty for immigrants and their children. Since a child's standard of living is a function of his or her parents' income, this method captures the full effect of immigration on the incidence of poverty in the United States. Knowing that our immigration policy is causing poverty to grow significantly does not tell us what we should do about this situation. The negative implications for immigrants and their children and society in general make it clear that we cannot continue to ignore this problem. Two sets of policy options should be implemented to deal with this problem. First, immigration policy should be changed with the intent of reducing the flow of immigrants likely to end up in poverty. As has already been pointed out, without a change in immigration policy, an estimated 10 million new immigrants will arrive in just the next decade. A large percentage of these immigrants and their young children will end up in or near poverty if we continue to select immigrants in the same manner as in the past. The second set of policy options to deal with this problem would involve the development and implementation of policies that address the needs of immigrant households already here. This would have to be done in the context of existing anti-poverty programs and with the intent of meeting the specific needs of immigrant households in poverty. Because low educational attainment is one of the primary reasons for the high poverty rate associated with immigrants, selecting a larger proportion of immigrants based on their skills would reduce poverty among immigrants who arrive in the future. In most years, 65 to 70 percent of visas are allotted to the family members of U.S. citizens and Lawful Permanent Residents (LPRs). By limiting which relatives are eligible for admission, the number of immigrants who are admitted without regard to their skills or ability to compete in the modern American economy could be reduced. The Commission on Immigration Reform chaired by the late Barbara Jordan suggested limiting family immigration to the spouses, minor children, and parents of citizens and the spouses and minor children of LPRs. This would eliminate the preferences now in the law for the siblings and adult children (over age 21) of citizens and LPRs. The preference for the spouses and children of non-citizens should also probably be eliminated, since these provisions apply to family members acquired after the alien has received a green card, but before he or she has become a citizen. If the parents of citizens were also eliminated as a category, family immigration would be lowered to roughly 300,000 per year, and the number would likely fall to 200,000 in a few years. Humanitarian immigration should also undergo some changes. A greater effort should be made to limit asylum and refugee status to those who are genuinely in need of permanent resettlement because of political persecution or a well-founded fear of persecution. The expansion of asylum grounds to groups not originally intended is likely to undermine public support for this small but needed category of admission. Abuse of the asylum law also encourages illegal immigration by allowing those who make it into the United States to claim asylum on specious grounds in an effort to forestall deportation. As for refugees, the system must continue to remain flexible and in some years it may need to expand well beyond the 50,000 originally intended by the Refugee Act of 1980. Limiting resettlement to 50,000, however, would still allow the United States to take in all of the persons identified by the U.N. High Commissioner for Refugees as needing permanent resettlement. The Jordan Commission also suggested eliminating the visa lottery. While the lottery represents only 6 to 8 percent of the legal immigrant flow, it makes little sense to admit immigrants based on luck. Restricting family immigration to only the spouses and minor children of U.S. Citizens, rationalizing humanitarian immigration, and ending the lottery would significantly reduce the number of legal immigrants admitted each year without regard to their ability to compete in the U.S. economy. This would ensure that immigration does not continue to cause a substantial increase in poverty into the indefinite future. While the overwhelming majority of people in poverty living in immigrant households are legal immigrants or the U.S.-born children of immigrants, reducing illegal immigration would still be helpful because illegal immigrants tend to be very low-skilled. Among those who study the issue, there is broad agreement that cutting off illegal aliens from jobs offers the best hope of reducing illegal immigration. There are three steps that are needed to make worksite enforcement more effective. First, a national computerized system that allows employers to quickly verify that persons are legally entitled to work in the United States needs to be implemented. Tests of such systems have generally been well received by employers. Second, the INS must significantly increase worksite enforcement efforts. Congress has repeatedly failed to increase funding for enforcement, even though the INS continues to ask for more agents. Third, despite increases in funding over the last few years more could be done at the border. Controlling the border with Mexico would require perhaps 20,000 agents and the development of a system of formidable fences and other barriers. The cuts in legal immigration proposed earlier would also go a long way toward reducing illegal immigration in the long run because the current system creates a strong incentive to come illegally. There are approximately 4 million people qualified for immigration to the United States but who are waiting their turn to receive the limited number of visas available each year in the various family categories. Such a system encourages those who have been selected, but have to wait, to simply come to the United States and settle illegally in anticipation of the day their visa is issued. Eliminating the sibling and adult children categories would alleviate this situation by doing away with the huge waiting lists. Cutting legal immigration would also be very helpful in controlling illegal immigration because communities of recent immigrants serve as magnets for illegal immigration, providing housing, jobs, and entree to America for illegal aliens. The changes in legal and illegal immigration policy outlined above would, after a few years, restore immigration levels to their historical average of about 300,000 to 400,000 annually. Even with these changes, however, the United States would continue to accept more than twice as many immigrants as any other country. While decreasing the number of less-skilled legal and illegal immigrants would ensure that fewer immigrants admitted in the future end up in poverty, it would not lift immigrants and their children already in the country out of poverty. The most direct way to reduce poverty for immigrants is to increase the dollar value of means-tested cash programs designed to assist persons in or near poverty. The primary disadvantage of this approach is the cost. Expenditures on means-tested cash assistance programs total $86 billion a year. The fiscal costs associated with a dramatic increase in spending on cash assistance programs creates political obstacles that seem insurmountable at present. While increases in such programs seem unlikely, it may be possible to further restore immigrant eligibility for welfare programs beyond what has already been done. However, further restoration of benefits to immigrants that were cut as part of welfare reform should be done as a matter of fairness. It should not be seen as a way of significantly reducing immigrant poverty because, as already noted, welfare reform did not increase immigrant-related poverty. Because one has to work to receive benefits, the Earned Income Tax Credit (EITC) is one means-tested income transfer program that has considerable political support. Increasing the value of this program would certainly be helpful to the nearly 5 million persons who are poor and live in an immigrant household where at least one person works. Of course, this program is also costly — $22 billion annually. Moreover, the EITC would not help the 2.7 million persons living in immigrant households where no one works. Another area where new initiatives may be possible is job retraining, which also tends to be more popular than income redistribution. Since the low skill level associated with immigrants is one of the primary reasons so many are in poverty, increasing their ability to compete in the labor market would certainly help reduce their poverty rates. Ideally, new programs specifically designed to help immigrants adjust to life in their new country should also be developed. This may include adult English-language instruction and new efforts to make immigrants better able to access both the U.S. job market and services available from government and private sources. Reducing the flow of less-skilled immigrants who enter each year would also have the desirable effect of reducing job competition between more established immigrants and new arrivals for low-wage jobs. Reducing the supply of this kind of labor would create upward pressure on wages and benefits for the working poor, including immigrants already in the country. Over time this should reduce poverty among immigrants who work. The findings of this study indicate that poverty in America is increasingly being driven by immigration policy. With immigrant households now accounting for more than one-fifth of the poor, and one-fourth of child poverty, immigration policy should become an integral part of any discussion of poverty in America. In fact, it is not too much to say that an understanding of immigration has become essential to understanding the cause of poverty in America. Why Has This Problem Largely Been Ignored? Part of the reason immigrant-related poverty has not attracted the attention it should is that until relatively recently immigrants and their children did not account for a large proportion of the poor. Policy makers and researchers concerned about poverty have generally focused on other issues such as wages for less-skilled workers, changing family structure, discrimination, and the level of government benefits. Moreover, immigrants are not politically influential. Many are not citizens and therefore cannot vote or afford to make campaign contributions. Also, as already mentioned, immigration is a discretionary policy of federal government. Elected officials in Washington may be reluctant to call attention to the fact that they have either supported — or at least not opposed — policies that have led to enormous growth in the poor population. Another reason the dramatic growth in immigrant-related poverty largely has been ignored stems from the dual role immigrant advocates often play. Most are also advocates for the current high level of immigration. These advocacy groups may be hesitant to call attention to immigrant-related poverty because to do so would highlight a fundamental problem with the very policy they work so hard to keep in place. Costly new income support programs and efforts to increase the skills of immigrants so they can better compete in the labor market would undermine one of the arguments most often made by supporters of high immigration, namely that it is an economic and fiscal benefit to the country. In a very real sense, there is a conflict of interest between being an advocate for immigrants and being an advocate for mass immigration. As a result, those who are supposed to speak for immigrants do not call for the kind of large-scale effort needed to help the millions of immigrants and their children who languish in poverty. While some may be tempted to ignore immigrant-related poverty at a time of relative prosperity, this seems very unwise. In just the last eight years the size of the poor population increased by three million as a direct result of the growth in poverty among persons in immigrant households. If current trends continue, by the end of the next decade, 11 million people residing in immigrant households will live in poverty, accounting for perhaps 30 percent of the nation's total poor. The implications of this situation for the immigrants themselves, their children, and American society in general must be acknowledged eventually. If we wish to continue to admit the vast majority of immigrants without regard to their skills or ability to compete in the U.S. labor market, then new programs must be developed to deal with the poverty that will inevitably result from such a system. To do otherwise is not in the best interests of either the United States or the immigrants themselves. In the past, examinations of poverty in the United States have typically focused on how broad economic and societal trends and social welfare policy affect either the size of the poor1 population or the socio-demographic characteristics of those in poverty. Little effort has been made to evaluate the impact of immigration policy on the incidence of poverty in the United States. This report looks at the composition of persons living in poverty in 1979, 1989, and 1997. The findings indicate that despite a strong economy over much of this period and a slight decline in the poverty rate for persons in households headed by the native-born, the poverty rate of persons in immigrant households has remained high and has actually increased significantly in the last two decades. As a result, most of the increase in poverty in America in the last two decades was caused by immigration. Since an official poverty level was established in the early 1960s, the nation's poverty rate has witnessed several trends. After falling sharply in the 1960s and the first few years of the 1970s, the national poverty rate stabilized at around 11 or 12 percent though the 1970s. In the early 1980s the poverty rate began to rise, and despite strong economic growth in most of the 1980s and 1990s it has remained somewhat higher ever since (Dalaker and Naifeh, 1998). A number of authors have explored the reasons for changes in the nation's poverty rate and size of the poverty population (Harrison and Bluestone, 1988; Blank 1991; Hanratty and Blank, 1992; Devine and Wright, 1993; Mishel, Bernstein, and Schmitt 1999). Trends in the country's poverty rate have generally been attributed to short-term economic conditions associated with the business cycle and the unemployment rate, long-term macroeconomic changes such as deindustrialization, shifts to family types that are more vulnerable to being in poverty, and government policy such as the real value of the minimum wage and the level of Social Security benefits. Although the level of immigration is also a federal policy not unlike the value of the minimum wage, researchers generally have not examined its effect on the number of people in poverty or the nation's overall poverty rate. Partly as a result of changes made in immigration law in the mid-1960s, as well as subsequent changes, the level of immigration has been rising steadily for the last three decades. At present, between 800,000 and 900,000 legal immigrants and an estimated 420,000 illegal immigrants settle permanently in the country each year (1996 Statistical Yearbook of the Immigration and Naturalization Service, 1997). As a result, the immigrant population has grown rapidly, almost tripling in number from 9.6 million in 1970 to 26.3 million in 1998; and these numbers do not include the U.S.-born children of recent immigrants. As the level of immigration has increased over the last three decades, the education level of immigrants in comparison to natives has declined significantly (Borjas 1994; Edmonston and Smith, 1997). This decline has prompted some to worry that immigrants may be falling behind natives economically. One of the most worrisome consequences of the relative decline in immigrant skills is that a growing percentage may end up in poverty. This analysis has two primary goals. The first is to examine the direct effect immigration has on the size and growth of poverty at the national, regional, state, and local level using the most recent data available. Second, in order to better understand the causes of immigrant poverty the study also provides detailed information on the socio-demographic characteristics of persons in poverty based on whether they reside in a native- or immigrant-headed household. It is our hope that this study will provide policymakers, researchers, and others interested in the immigration debate with valuable information on the critical question of poverty associated with immigrants. There are, of course, many possible definitions of poverty and what it means to be poor. The official definition of poverty, however, and the one used in this study was developed by the Social Security Administration in 1964. While there have been some minor changes over the years, persons are considered in poverty if the family in which they reside has pre-tax cash income below an officially determined threshold. Families are defined as a group of people related by marriage or blood living in the same housing unit.2 Persons living by themselves or with persons to whom they are unrelated are in effect their own family and their poverty status is calculated based on their individual income. Poverty status is not determined for persons who are institutionalized. A household consists of all persons living in a housing unit such as an apartment or house. Although most households consist of only one family, there can be more than one family living in the same household. The household head or householder is selected as a reference person and is typically the owner of the property or the person whose name is on the lease. The relationship of the head to other persons in the household is recorded by the Census Bureau. Impact on the Poor Already Here. One may reasonably ask whether it matters what proportion of persons in immigrant households, or even in native households, live in poverty. What effect, if any, does a higher national or local poverty rate have on the quality of life in a community or the country as a whole, especially for the majority of the population who are not poor? In addition to altruism, there are a number of very practical reasons to be concerned about poverty in America and the role that immigration policy may be playing in its perpetuation and growth. Probably the most obvious reason for concern is the impact on the poor already here, both native and immigrant. The cost of anti-poverty programs depends in large part on the number of people who are eligible to receive benefits and services. If immigration increases the number of people who are in need of assistance, then the total cost of means-tested programs must grow accordingly. Increasing the total cost of anti-poverty programs can only reduce political support for programs that are often already unpopular. Alternately, if government outlays on programs for the poor are kept constant, then the benefit level or services provided to each recipient must be reduced so that overall costs remain the same. This too is clearly not in the interest of American's poor. In addition to means-tested programs, other services may also be strained by increasing the size of the poor population. Many school systems that serve large numbers of low-income or at-risk students may be overwhelmed by the arrival of large numbers of children from poor immigrant families. A large increase in the size of the poor population may also strain the resources of non-governmental institutions, such as charities which serve low-income populations. Therefore, if one is concerned about the poor already here, increasing the number of people below or near poverty through immigration is clearly counter-productive. Probably the most self-interested reason to be concerned about increasing poverty through immigration is its effect on public coffers. As is the case in all Western industrial democracies, each individual on average must be able to pay a good deal in taxes to cover his use of public services. In the United States, expenditures by federal, state, and local governments now account for roughly one-third of GDP. Because of the progressive nature of most income taxes, families with incomes below the poverty line pay very little in federal, state, and local income taxes. Of course, the poor do pay some taxes such as real-estate (directly as owners or indirectly through their rent) and sales taxes. However, commensurate with their very low income, the amount of non-income taxes generated by persons living in poverty is also very low. In addition to very low tax contributions, the poor are the primary beneficiaries of means-tested programs such as Temporary Assistance to Needy Families, Supplemental Security Income, Food Stamps, and subsidized housing. In short, there is no question that persons living in poverty, almost without exception, are a net fiscal drain.4 Therefore, if immigration increases the size of the poor population, then it is very likely that there will be a negative effect on public coffers. This is especially true in cities and states where large number of poor immigrant households are concentrated. In addition to the effect on the poor already here and taxpayers, there are more subtle but perhaps equally important reasons to be concerned about the size of the poor population. While many factors contribute to the general stability of society, the distribution of income clearly matters. As the well-known political scientist Seymour Martin Lipset (1959) has pointed out, democracy can only really work in societies that are not beset by widespread poverty and deprivation. Not surprisingly, recent scholarship has found a strong correlation between the level of wealth and income enjoyed by society's members and democratic stability (Rueschmeyer, Stevens, and Stevens, 1992; Gasiorowski and Power, 1998). Uslaner (1999) has found that the level of income inequality has an impact on how people view one another: with more poverty comes less trust and a greater suspicion of others. In addition to social science research, common sense suggests that greater disparities in income create greater social distance between society's members and thus will have a negative impact on political and social harmony. A variety of societal problems are closely linked to poverty. It is well established that children who grow up in poverty are more likely to be involved in illicit activity, have higher teenage pregnancy rates, exhibit lower academic achievement, and suffer from a host of other social problems than are children who do not grow up in poverty (Devine and White, 1993). The size of the poor population may also have important implications for the overall competitiveness of the American economy. Not only because of the added tax burden it brings, but also because immigrants earning poverty level wages clearly do not have the kind of skills necessary to compete in an increasingly global marketplace. In addition to the impact on American society in general, looking at poverty among immigrants is also important because it is one way of evaluating the consequences of current immigration policy. It also gives us a good idea of how immigrants admitted in the future are likely to do in the United States if immigration policy remains unchanged. Very high poverty rates imply that a significant proportion of immigrants are unable to succeed in the modern American economy. This is particularly important because without a change in immigration policy, 10 million new immigrants will likely settle permanently in the country in just the next decade. Of course, the poverty rate for immigrant households does not tell us exactly how those admitted in the future will fare. However, looking at past immigrants is probably the best means we have of predicting how tomorrow's immigrants will do if the same selection criteria continue to be used. In addition to immigration policy, which is concerned with who may come and how many, there is immigrant policy, which deals with how we treat the foreign-born living in United States. Looking at poverty among immigrants is helpful because if a large percentage of immigrants and their children already here are in poverty we need to deal with this problem in a constructive manner, whatever immigration policy is adopted in the future. Such things as English language instruction, income transfer programs, and job training specifically targeted at immigrants represent the kinds of immigrant policies that may be needed in order to lift immigrants out of poverty. At the very least, if immigrants and their children comprise a large share of the poor, our anti-poverty efforts as well as research on poverty must take this new reality into account. The data in this study come primarily from the 5 percent public use sample of the 1990 Census5, and the March 1998 Current Population Survey (CPS). While the primary emphasis of this study is on the 1990s, a sample drawn from the 1980 Census is also used to provide historical perspective.6 The Census and CPS are used because they are the best sources of information on persons born outside of the United States — referred to as foreign-born by the Census Bureau. Persons not born in the United States, one of its outlying territories or to U.S. parents living abroad are foreign-born. All persons born in the United States, including the children of illegal aliens, are natives. For the purposes of this report, foreign-born and immigrant are used synonymously. As already described above, individual poverty status is determined based on yearly income. The March CPS and Census ask respondents about their income in the preceding year. Therefore, as is the case with statistics published by the government, the poverty figures in this study from the March 1998 CPS are for 1997 and the figures from the 1980 and 1990 Censuses are for 1979 and 1989 respectively. Defined in this way, 92.2 percent of the people living in immigrant-headed households were immigrants themselves (67.4 percent) or the native-born child under age 21 (24.8 percent) of an immigrant father or mother in 1998. In households headed by immigrants who arrived after 1970, 95.4 percent of the people are either immigrants or their U.S.-born children under 21. Therefore, this approach primarily measures poverty for immigrants and their young children. Since a child's standard of living is a function of his parents' income, this method captures the full effect of immigration on the incidence of poverty in the United States. For the remainder of this study the terms "immigrant-related" and "immigrant-associated" refer to persons living in immigrant households. Country of origin and year of entry for immigrant households are based on the responses of the household head. Figure 1 shows the growing poverty rate for persons in immigrant households between 1979 and 1997. The first bar in each year shows the percentage of natives who are in poverty. The second bar shows the percentage of persons living in immigrant households in poverty. Figure 1 indicates that while the poverty rate for natives has actually fallen slightly over the 18-year period, the poverty rate for persons living in immigrant households has increased 41 percent from 15.5 to 21.8 percent. The difference or gap between the poverty rates of persons in native and immigrant households has grown even more dramatically. In 1979, persons living in immigrant households were 28 percent more likely to live in poverty than those living in native headed households. By 1990, they were 52 percent more likely and by 1997 persons living in immigrant households were 82 percent more likely to be in poverty than persons living in native households. Clearly, as the level of immigration to the United States has increased in the last two decades, the poverty rate associated with immigrants has grown dramatically. While the poverty for persons in immigrant households has increased substantially in the last 18 years, Figure 1 may be somewhat misleading. Like any measure, the poverty line is somewhat arbitrary. It is possible that persons in immigrant households who live below the poverty line have higher incomes than their counterparts in native households. The income deficit (the difference in dollars between a family's income and its poverty threshold) is commonly used to measure the intensity of poverty. In 1997, the average income deficit for families in poverty in immigrant-headed households was $6,931, somewhat higher than the $6,517 for families in native households.8 Therefore, it appears that immigrant-related poverty is more intense than poverty associated with natives. The income of such persons places them above the official poverty threshold, but they are still quite poor by American standards It is possible that persons in immigrant households, while more likely to be in poverty, are less likely to have incomes just over the poverty line. This, however, does not appear to be the case. In 1997, 13.4 percent of persons in immigrant households had incomes that were between 100 and 150 percent of the poverty threshold, much higher than the 8.6 percent for persons in native households. Combining this high rate of near poverty with their high poverty rate means that 35.2 percent, or 12.4 million persons, in immigrant households live below or near the poverty line. The corresponding figure for natives is 20.6 percent. Like the income deficit associated with immigrants, the near-poverty rate for immigrants indicates that Figure 1 does not overstate immigrant-related poverty. If anything, it understates the size and scope of the problem. In 1996, concern over immigrant use of means-tested programs led Congress to reduce welfare eligibility for some immigrants as part of a general overhaul of the welfare system. In particular, Congress made some recent non-refugee immigrants ineligible to receive several federally funded programs, including SSI, AFDC/TANF, and food stamps, until they had been in the country for a certain period of time. While in-kind benefits such as food stamps are not included in poverty calculations, cash assistance programs like SSI and AFDC/TANF are considered income and are included. Therefore, it is possible that reduced access to these two programs increased the poverty rate for immigrants and their children. At least so far, however, the available evidence suggests that welfare reform is not responsible for the rise in the poverty rate for persons in immigrant households. Figure 1 shows that the rise is a long-term trend that began well before the enactment of welfare reform in 1996. Between 1979 and 1989, poverty increased for persons in immigrant households from 15.5 to18.8 percent and the gap between immigrants and natives increased from 3.4 to 6.4 percentage points. The second reason to think that welfare reform did not increase immigrant-related poverty is that, since its enactment, poverty has actually declined slightly for persons in immigrant households. More important, the gap between persons in immigrant households and native households has actually narrowed somewhat since 1995. In 1995, the difference between the poverty rate for persons in immigrant and native households was 11.5 percentage points, larger than the nearly 9.8 percentage point gap in 1997.9 If welfare reform had increased the poverty rate for persons in immigrant households, then there should have been some jump in immigrant-related poverty, especially in comparison to natives. The lessening of the gap between immigrants and natives makes it very unlikely that welfare reform is responsible for any of the rise in immigrant-related poverty found in Figure 1. The third reason to doubt that welfare reform played a role in increasing poverty for persons in immigrant households is that although Congress changed welfare eligibility requirements for some immigrants, most immigrants remain eligible to receive welfare benefits. Moreover, Congress has restored welfare benefits to a significant portion of immigrants who lost their eligibility in 1996, and most state governments have used their own funds to provide ineligible immigrants with some welfare coverage. In addition, immigrants who cannot receive benefits themselves are still able to receive benefits on behalf of their U.S.-born children. Based on the March 1998 CPS, immigrant welfare use remains much higher than that of natives. In 1998, use of AFDC/TANF, state-funded general assistant programs, and SSI was between 29 percent and 40 percent higher for households headed by immigrants than those headed by a native (Camarota, 1999). Thus, despite welfare reform, immigrants continue to be heavy users of the welfare system. Overall, the available evidence indicates that the growth in poverty associated with immigrants was not caused by changes in welfare eligibility. The rise began well before 1996 and there has been no significant jump in immigrant poverty since welfare reform was enacted. This is true both in absolute terms and relative to persons in native households. Of course, the fact that welfare reform did not increase poverty for persons in immigrant households does not mean that Congress was right to curtail welfare eligibility for immigrants. As we will see, the low level of educational attainment of many immigrants, along with other socio-demographic characteristics, indicates that they need access to the welfare system even more than do natives. While it may make little sense to have an immigration policy that admits large numbers of people who need means-tested programs, cutting welfare benefits to immigrants after they have already been allowed into the country seems neither fair nor wise. Reflecting the growth in the number of people living in immigrant households along with their rising poverty rate in the 1980s and 1990s, persons in immigrant households account for a growing share of the total poor. The first bar in Figure 2 reports the number of people in immigrant households who live in poverty. Between 1979 and 1997 this number increased from 2.7 million to 7.7 million — a 185 percent increase. This enormous growth is striking because over the same period the total number of people in immigrant households increased only 104 percent, from 17.3 million to 35.3 million. Thus, immigrant-related poverty grew almost twice as fast as the total population living in immigrant households. The immigrant share of the total poor population has also grown dramatically in the last 18 years. The second bar in Figure 2 shows the proportion of all persons in poverty who live in immigrant households. In 1979, persons living in immigrant households accounted for 9.7 percent of the total poor population. By 1989 they were 14.8 percent of the total poverty population and by 1997 individuals in immigrant households accounted for 21.6 percent of all persons living in poverty in the United States. Put another way, more than one out of five persons in poverty now lives in an immigrant household, whereas in 1979 the figure was less than one in 10. The rough estimates provided above probably overstate the impact of illegal immigration for two reasons. First, defining who is an illegal alien is not as straightforward as it might seem. A large percentage of those in the country "illegally" actually have the permission of the federal government. Many are asylum applicants awaiting the outcome of their petition to stay in the country. Others enjoy Temporary Protected Status (TPS) because, although they do not qualify for asylum, the federal government will not deport them or require them to leave because it is thought conditions in their home countries are such that they cannot return. In addition, there are several hundred thousand persons who are the spouses and children of amnesty beneficiaries from the 1980s who are also allowed to stay in the country. If these "semi-legal" immigrants are excluded, then illegal aliens would account for an even smaller share of immigrant-related poverty. Second, it is also worth noting that many illegal aliens come to the United States to join friends and family members who are legal residents. Communities of recent legal immigrants serve as magnets for illegal immigration by providing housing, jobs and entree to America. Additionally, about one out of four legal immigrants who receive green cards in any given year are in fact illegal aliens already living here (INS press release, January 1999). Thus, it is probably more accurate to view illegal immigration as a direct consequence of large scale legal immigration and not as a distinct phenomenon that should be thought of separately. Table 1 also shows that the poverty rate for recent immigrant has increased over the last 18 years. Recent households are defined as those headed by an immigrants who arrived in the 10 years preceding the survey. In 1979, the poverty rate for persons in recent immigrant households was 23.0 percent. In 1989 it had grown to 28.3 percent, and by 1997 it had increased still further to 29.2 percent. The increase in poverty rates of recent immigrants in the last two decades is somewhat surprising in light of the strength of American economy for most of 1980s and 1990s. All other things being equal, low unemployment and strong demand for labor should have reduced poverty rates for new arrivals in comparison to the more difficult economic situation of the 1970s. What these results suggest is that, despite generally favorable economic conditions, a growing share of new arrivals simply do not possess the skills necessary to compete in the U.S. economy. As a result, a growing proportion end up poor. One possible cause for an increase in the poverty rate for persons in immigrant households may be that new arrivals make up a growing share of the total population living in immigrant households. Since they generally have higher poverty rates, the rise in immigrant-related poverty may simply be a statistical artifact caused by the fact that households headed by new immigrants make up a larger share of the total population living in immigrant households. However, this is not the case. In fact, new arrivals actually declined slightly as a share of the total population living in immigrant households between 1979 and 1997. In 1979, households headed by immigrants who arrived in the 10 years prior to the survey comprised 32.5 percent of all persons living in immigrant households. By 1989 it had increased only slightly to 33.8 percent, but by 1997 recent households had fallen to only 30.5 percent of all persons living in immigrant households. It is clear, then, that the increase in immigrant-related poverty was not caused by a significant change in the proportion of the total population accounted for by new arrivals. While they may not account for a growing share of the total population living in immigrant households, the increasing poverty rate for new arrivals does have significant long-term consequences for the overall poverty rate of persons in immigrant households. Because their initial poverty rates are now so high, it will take decades for them to close the gap with natives even if poverty falls at the same pace for these households as it did in the past. Moreover, there is evidence that the pace of decline in immigrant-related poverty is slowing. In 1979, the poverty rate for persons in 1970s immigrant households was 23 percent. By 1989 it had fallen 4.7 percentage points to 18.3 percent — a 20 percent decline. In contrast, the poverty rate of 1980s immigrants had fallen only 2.9 percentage points, or 10.3 percent, by 1997 from 28.3 percent in 1989. Of course, 1989 to 1997 is only an eight-year period and not a full decade. It may be that the poverty rate for persons living in households headed by 1980s immigrants will decline very rapidly in the next two years. So far, however, this appears not to be the case. Taken together the trends found in Table 1 indicate that there are two reasons for the growth in poverty among persons residing in immigrant households. First, the poverty rate among new arrivals has increased over the last 18 years. As a result, it takes much longer for them to catch up with natives. Second, the pace of decline in poverty among persons living in immigrant households has slowed. These two trends, coupled with fact that immigration is now running at record levels, means that immigration has become a determinate factor in the size and growth of poverty in the United States. Between 1979 and 1989, 2 million or 53 percent of the 3.8 million increase in the number of people living in poverty was attributable to the growth of poverty among persons in immigrant households. The effect of immigration is even more dramatic in the 1990s with the growth in immigrant-related poverty accounting for three million or 75 percent of the increase in the size of the poor population in the United States. Persons in immigrant households now comprise such a large share of the poor that they have a significant impact on the nation's overall poverty rate. For example, if households headed by immigrants who arrived between 1990 and 1997 are excluded, the nation's overall poverty rate would actually have fallen from 13.1 percent in 1989 to 12.7 percent in 1997, instead of increasing to 13.3. And if all persons in immigrant households are excluded, then the nation's poverty would have been 12 percent in 1997 or 1.3 percentage points lower, very similar to the 12.4 percent it was at the end of the 1970s. These numbers imply that the size of the poverty population in the United States is increasingly determined by the nation's immigration policy. Table 2 reports poverty rates by regions of the world and year of entry in 1989 and 1997. The table reveals that while poverty rates are higher for immigrants from most regions of the world than for natives, there are substantial differences among immigrant households. In 1997 for example, the poverty rate for persons in Mexican-headed households was three times that of individuals living in households headed by European immigrants. The poverty rate for persons in Central American, Caribbean, and Mexican households were all more than double that of native households. In fact, with the exception of Europe, the poverty rates for persons in immigrant households were at least 19 percent higher than that of native households. Additionally, comparisons of 1989 and 1997 reveal that, with the exception of Asian and South American households, poverty rose for households headed by all immigrant groups. Thus, Table 2 indicates that the increase in immigrant-related poverty between 1989 and 1997 was caused by a rise in poverty for immigrants from most of the major sending regions of the world. The lower portion of Table 2 reports poverty by entering cohort by region of origin. It shows that the pace of decline in poverty differs for each group. For instance, the poverty rate for 1980s Mexican households, declined 4.3 percentage points or 11 percent between 1990 and 1997. In contrast, the poverty rate for 1980s Asian households declined 6.8 percentage points or 27 percent over the same period. Thus, not only do some groups arrive with lower poverty rates, they are also able to move out of poverty more quickly than others. One reason for this difference is the education level of immigrants from different countries, which vary enormously by region of origin. For example, in 1997, 67 percent of adults 25 and over in Mexican headed households lacked a high school degree compared to only 16 percent of adults in households headed by an immigrant from Asia and 20 percent in households headed by a European. Because initial poverty rates are so much higher for some immigrant groups than for others and because the pace of decline also varies by region of origin, very large differences in poverty rates exist between immigrant groups even after they have been in the United States for many years. In 1997 for example, 21 percent of persons living in households headed by a Mexican who arrived prior to 1970 still lived in poverty, compared to only 8 percent of pre-1970 European households. Since the sending countries have shifted in the last 30 years, it is possible that the slowing in the pace of decline in the poverty rate for more recent immigrants partly reflects the changing country of origin of immigrants. The characteristics of persons living in immigrant households are probably the most important factor to consider when examining poverty. One of the best predictors, regardless of nativity, of a person's income and propensity to be in poverty is their education level. Table 3 reports the poverty rates for persons 25 and older living in immigrant and native households by educational attainment. The table indicates that poverty varies enormously based on education level. In 1997, the poverty rate for dropouts, regardless of the household in which they reside, was 24.5 percent. For those with a high school degree it was 9.9 percent, and for persons with some college or a four-year college degree it was 6.5 percent and 3.1 percent respectively. Since adults in immigrant households are much more likely than those in native households to lack a high school education (34 percent compared to 15 percent), the high poverty rate among persons in immigrant households is partly explained by the high proportion with few years of schooling. Of adults in immigrant households in poverty, 58 percent lacked a high school education in 1997. While education is a very important, other factors also play a role in elevating the poverty rate among those in immigrant households. In fact, in both 1989 and 1997 the gap between immigrant and native poverty was proportionately greatest among individuals with more education. Persons with some college living in immigrant households were almost twice as likely as persons in native households with the same education to live in poverty in 1997. For college graduates the poverty rate for adults in immigrant households was triple that of natives. Moreover, with the exception of those with a four-year college degree, poverty rates for persons 25 and over increased significantly between 1989 and 1997 in immigrant households in all educational categories. Even among college graduates, however, the gap between college graduates in immigrant and native households widened in the 1990s because the poverty rate for native college graduates fell even more. While immigrant-related poverty increased in three out of four educational categories, the poverty rate for persons in native households went down in three out of four educational categories. Only among dropouts did poverty rise in native households. Over all, Table 3, like Table 4, indicates that the rise in poverty among persons in immigrant households was very broad and not simply confined to persons with few years of schooling. Race is also an important predictor of poverty status. Table 4 reports poverty rates by race with persons of Hispanic origin treated as a discrete category. Since region of the world is closely correlated with race, the pattern in Table 4 follows the same general pattern found in Table 2, with white and Asian immigrant households having the lowest poverty rates, while Hispanics have the highest. The table also shows that poverty among immigrants increased in the 1990s for all major racial groups expect Asians.14 Moreover, with the exception of blacks, persons in immigrant households have higher poverty rates than persons of the same race living in a native households. This gap widened in the 1990s for all racial groups with the exception of Asians. The high poverty rate for Hispanic immigrants may be of particular concern because this group is very large and it may take three or four generations for the descendants of these immigrants to reach economic parity with natives. The very high poverty rate associated with native-born Hispanics suggests that this is the case. Current immigration may well be creating a new underclass of Hispanics in America. At the very least, immigration policy maybe setting the stage for sizable ethnic differentials in economic outcomes that are likely to play an important social, economic, and political role throughout the next century. Table 5 reports poverty based on the labor force status of persons of working age. The data show that poverty is much higher among individuals who are unemployed, regardless of the household in which they reside. Persons in immigrant households are more likely to be unemployed. However, higher unemployment accounts for a small share of immigrant-related poverty. In 1997, only 7.5 percent of all persons of working age15 in immigrant households living in poverty were unemployed. Most of the increase in immigrant poverty in the 1990s did not occur because of a rise in unemployment among individuals in immigrant households. In fact, the unemployment rate for persons in immigrant households was actually lower, while the poverty rate for unemployed persons in immigrant households rose. Between 1989 and 1997, the increase in poverty among the unemployed accounted for just 77,000 or only four percent of the 1.78 million growth in poverty for persons of working age living in immigrant households. Almost all of the numerical increase in immigrant-related poverty was caused by a rise in poverty among persons holding jobs or those not in the labor force. In the 1990s, the rise in the poverty rate for persons of working age in immigrant households was caused by an increase in poverty in all three labor force categories. This is in sharp contrast to persons in native households, where poverty fell in all three categories. Thus, the increase in the poverty rate associated with immigrants relative to natives and in absolute terms was caused by a broad increase in poverty for the employed, unemployed, and those not in the labor force. As is the case with labor force status, poverty varies significantly by age. The increase in poverty associated with immigrants in the 1990s was widespread, affecting all ages, with the largest increase among children and persons 65 and over. In contrast, the poverty rate for persons in native-headed households fell for individuals 18 to 64 and for persons 65 and older; only among children did the poverty rate rise slightly for natives. Poverty is of course more common among children, regardless of the nativity of the household head. This is partly caused by the way in which poverty is calculated. The larger a family's size, the higher its poverty threshold is set. One consequence of this is that poverty tends to be more pronounced for groups which have higher fertility, such as immigrants or racial minorities. In 1997, 31 percent of people living in immigrant households were under age 17. In comparison, only 26 percent of all persons in native households were children. Thus, part of the reason poverty is more prevalent in immigrant households is that immigrants tend to have more children. Of course, Table 6 also shows that the poverty rate is much higher for persons in immigrant households regardless of age. Moreover, the increase in the poverty rate for children in immigrant households was 10 times larger than the increase in native households 6.1 percentage points compared to six-tenths of a percentage point for children in native-headed households. The increase in poverty for children in immigrant households was so large in the 1990s that by 1997 almost one in three children in an immigrant household lived in poverty. In addition, the near doubling from 1.78 to 3.33 million in the number of children in immigrant households living in poverty accounted for 1.55 million or 56 percent of the total increase in child poverty in the United States during the 1990s. And, by 1997, 23.6 percent or almost one in four children living in poverty in the United States resided in an immigrant household — a substantial increase from the 15.7 percent share in 1989. Taken together, these results clearly indicate that the growth of child poverty in the United States is increasingly being driven by our immigration policy. Turning to gender we see that, not surprisingly, persons of both sexes living in immigrant households have higher poverty rates than their counterparts living in native households, and the gap between immigrants and natives widened in the 1990s (Table 6). The widening of the gap was caused both by a decline in poverty for persons in native households and by an increase in poverty for persons of both sexes in immigrant households. However, the increase in immigrant-related poverty was much more pronounced among women than men. Between 1989 and 1997 poverty among females in immigrant households increased 4.3 percentage points or 22 percent. In contrast, poverty for males in immigrant households increased 1.9 percentage points or 11 percent. As a result, poverty in immigrant households has become significantly more pronounced among women than men. Table 7 reports poverty statistics by country of origin for the 15 countries with the largest number of post-1970 immigrants. Reflecting the wide variation in poverty rates by regions of the world found in Table 2, Table 7 shows that poverty rates differ significantly for households headed by immigrants from different countries. In fact, the variation between immigrant households is much larger than is the difference between immigrant and native households. Immigrants from most major Asian sending countries in particular have poverty rates that are much lower than immigrants from other parts of the world. In 1997, for example, the poverty rate for persons living in Mexican-headed households was six and one half times that of persons in Indian households. The differences between countries show that poverty rates for persons in immigrant households need not be higher than that of natives and in fact can be considerably lower. These differences to a large extent reflect the educational attainment of immigrants from different countries. If immigrants were better educated, their poverty would be considerably lower. Even among immigrants from the same region of the world poverty rates vary significantly. The 1997 poverty rate for immigrants from Latin America ranges from a low of 15.9 percent for persons living in Columbian households to a high of 40.5 percent for those in Dominican-headed households. Even among immigrants from East Asia, poverty varies considerably, from a low of 4.8 for Filipino households to a high of 15.8 for persons in Vietnamese households. Table 7 also shows that poverty among persons living in Mexican households accounts for a very large share of immigrant-related poverty. In 1997, Mexican households accounted for 46.1 percent of persons in immigrant households living in poverty. This is a significant increase from 40.6 percent in 1989. Of course, Mexican households make up a very large proportion of all persons in immigrant households, accounting for nearly one in three persons in immigrant households in 1997. After Mexicans, Dominican-headed households account for the next largest share of immigrant-related poverty — 5.1 percent in 1997. Reflecting the great diversity in the immigrant population, no other country accounts for more than 4 percent of immigrant-related poverty. Several general observations are possible from the educational, racial, labor force status, age, and country of origin information in Tables 3, 4, 5, 6, 7. It is clear that the low level of educational attainment, higher unemployment and larger number of children account for much of the higher poverty rate associated with immigrants. However, it is also clear that poverty among persons in immigrant households is higher than that of natives regardless of age, education level, or employment status. Such factors as unfamiliarity with their new country, limited knowledge of English, and cultural factors probably explain these differences. Additionally, since a large percentage of immigrants are members of racial or ethnic minority groups, discrimination may also play a role in lowering their incomes and increasing their poverty rates. Of course, discrimination cannot explain the increase in immigrant poverty in the 1990s for immigrants from the same country. Since there is no body of research to indicate that discrimination systematically intensified in the 1990s, the rise in poverty for persons living in Mexican, Haitian, or Cuban households is almost certainly due to other factors. As we will see, even after controlling for a wide variety of variables, including race, poverty is still higher in immigrant households than in native households. So far this report has only examined immigrant-related poverty based on the individual characteristics of persons in immigrant and native households at the national level. While certainly important, national figures may obscure important differences that exist across the country. For this reason, we now turn to an examination of immigrant-related poverty by region of the country, state, and metropolitan area. There are significant differences in the poverty rate for people living in immigrant households across different parts of the country16 (Tables 9, 10, 11, 12). While poverty statistics for the top immigrant-receiving states are also reported later in this study, the regional data for 1997 from the CPS is drawn from much larger samples than are the state figures and are therefore much more reliable. The overall increase in the poverty rate for persons in immigrant households in the 1990s was caused by an increase in poverty in the West, Midwest, and Northeast. Because of a drop in the poverty rate for immigrant households in Texas, the poverty rate for persons in immigrant households in the South fell slightly, by one-half of one percentage point. However, even in the South the gap between immigrants and natives increased because the poverty rate for persons in native households fell much more dramatically than for those in immigrants households. Therefore, the widening of the gap between immigrant and native households nationally was caused by an increase in every region of the country. In 1997 the poverty for persons in immigrant households was the highest in the West at 24.6 percent, followed by the South at 22.3 percent, the Northeast at 19.1 percent, and the Midwest at 16.0 percent. The gap between immigrant and native households was also the largest in the West at 13 percentage points, followed by the South with 8.5 percentage points, the Northeast with 7.7 percentage points and the Midwest at 6 percentage points. There is no region of the country where immigrant poverty is not at least 60 percent higher than that of natives. Poverty in the Northeast. Turning to the specific regions of the country, the largest increase in immigrant-related poverty was in the Northeast, where poverty rose 39 percent from 13.7 to 19.1 (Table 8). This is significantly larger than the 3 percentage point (16 percent) increase for immigrant households nationally. Despite this dramatic rise in immigrant-related poverty in the Northeast, the poverty rate for persons in immigrant households in this part of the country was still below the level associated with immigrants nationally in 1997. The gap between persons in immigrant and native households also grew significantly in the Northeast, more than doubling from 3.7 to 7.7 percentage points in the 1990s. This widening of the gap between immigrant and native households is significantly larger than the increase nationally. In contrast to the nation, the increase in the size of the gap between immigrant and native households in the Northeast was caused exclusively by a rise in the poverty rate of persons in immigrant households and not by any reduction in native poverty. In fact, native poverty has increased somewhat in the Northeast during 1990s. The increase in the size of the poverty population associated with immigrants was extremely large in the Northeast, from 888,000 to 1.61 million an 81 percent increase. Proportionally, this increase was larger in the Northeast than in any other region of the country. The immigrant share of the total poor population also grew significantly in the Northeast, from 16.6 percent in 1989 to 25 percent in 1997. And the 724,000 person increase in the size of the immigrant-related poor population accounted for 56 percent of the total increase in the size of the poor population in the region. This is somewhat less than the 75 percent that immigrant households accounted for nationally. As is the case in the nation, immigrants and their families are not spread evenly across the Northeast. In 1997, 85 percent of persons in immigrant households in the Northeast lived in just three states: New York, New Jersey, and Massachusetts. Table 12 reports poverty figures for individuals in immigrant and native households for the eight states with the largest immigrant-related populations. Poverty increased for persons in immigrant households in all three of these states in the 1990s. The percentage point increase was largest in New York, where immigrant-related poverty increased 6.8 percentage points (42 percent), followed by New Jersey with an increase of 4.7 percentage points (54 percent)17 and Massachusetts, where immigrant poverty increased 3.3 percentage points (25 percent). While the poverty rate for persons in immigrant-headed households rose in New York and Massachusetts, it did not rise as much as immigrant-related poverty. And in New Jersey, the poverty rate for individuals in immigrant households fell. As a result, the gap between immigrant and native households increased in all three states, with the largest increase in New York, where the gap more than doubled. The age data for the Northeast show the same basic pattern as the national figures, with child poverty being the most pronounced for both immigrant and native households. As in the nation as a whole, poverty increased for children in both native and immigrant households. However, the 10 percentage point increase for poverty among children in immigrant households was much larger than the 3 percentage point increase for children in native households in this region. Children in immigrant households now account for 25 percent of all children living in poverty in the Northeast -- not significantly different from the immigrant share of the total poor population in the Northeast. The year of entry data for the Northeast indicate that immigrants in the region seem to be less successful in escaping poverty over time than are immigrants nationally. In 1997, the poverty rate for persons in households headed by an immigrant who arrived in the 1980s was 25.8, 4.3 percentage points higher than it was in 1989. Thus, even after having been in the country for eight additional years, 1980s immigrants seem to have made no progress out of poverty. In fact, their economic situation seems to have deteriorated. This lack of progress for 1980s immigrants was not the only reason for the growth in immigrant poverty in this part of the country. The poverty rate for persons living in households headed by a new arrival also increased in the 1990s. In 1997, persons in households headed by 1990s immigrants had a poverty rate of 27.5 percent, considerably higher than the 21.5 percent for 1980s immigrants in 1989. The region of origin information located at the bottom of Table 8 shows the same basic pattern for immigrants from each part of the world found at the national level. The main difference between the Northeast and the nation as a whole is that the immigrant poor in the Northeast are more diverse. In particular, Mexican-headed households account for a very small share (5.8 percent) of immigrant-related poverty in the Northeast compared to the 46 percent they account for in the country as a whole. Overall, the findings in Table 8 indicate that, as is the case in the nation, the rise in immigrant poverty in the Northeast was caused by both an increase in poverty among new arrivals and by a lack of progress among 1980s immigrants. Poverty in the Midwest. The poverty rate of 16 percent for persons in immigrant households in the Midwest is lower than in any region of the nation (Table 9). In fact, poverty is less prevalent in the Midwest for both native and immigrant households. While the poverty rate associated with immigrant households is lower in the Midwest than in any other region, their poverty rate is still significantly higher than that of natives in the Midwest or natives nationally. Moreover, the poverty rate for persons in immigrant households in the Midwest increased 1.1 percentage points in the 1990s, from 14.9 to 16.0 percent. In contrast, the poverty rate for persons in native households in the region fell 1.8 percentage points to 10 percent. As a result, the gap between persons in immigrant and native households nearly doubled in the 1990s from 3.1 percentage points to 6.0 percentage points. As is true for all regions of the country, the size of the poverty population associated with immigrants increased dramatically in the Midwest, from 404,000 to 602,000 (49 percent). But, in contrast to other regions, the size of the native poor population actually fell by more than 600,000 in the 1990s. As a share of the total poor population, immigrant households in the Midwest increased from 5.8 percent to 9.3 percent during the 1990s. While proportionately a very large increase, immigrant households still account for a smaller share of the total poor population in the Midwest than in any other region of the country. Like in the Northeast, immigrants households are also highly concentrated in the Midwest. In 1997, 43.7 percent of persons residing in immigrant households in the region lived in only one state — Illinois. The poverty rate for immigrants in that state of 16.3 percent is roughly equal to that for the region as a whole (Table 12 ). As it did in the Midwest in general, immigrant-related poverty in Illinois increased while declining for natives. While the decline in native poverty in Illinois was similar in size to the decline for natives in the Midwest, the increase in immigrant-related poverty (2.9 percentage points) in the state was significantly higher than the regional increase. Therefore, if Illinois is excluded, poverty would still have increased in the Midwest between 1989 and 1997, although the increase would have been significantly smaller. The age data in Table 9 show the same basic pattern in the Midwest as other regions as well as the nation as a whole, with child poverty being the most pronounced for both immigrant and native households. In contrast to the trend in the rest of the nation, however, poverty in the Midwest actually declined for persons 17 and under in native-headed households in the 1990s; this is in stark contrast to the substantial increase in the poverty rate for children in immigrant households from 19.2 to 24.6 percent. As a result, immigrant-related child poverty was the sole reason for the 57,000 increase in the number of children living in poverty in the Midwest. Had it not been for the growth in immigrant-related child poverty, the number of children in poverty in the Midwest would have actually declined. Turning to year of entry, immigrant households in the Midwest are more successful in escaping poverty over time than immigrants nationally. Between 1989 and 1997, the poverty rate for persons in households headed by an immigrant who arrived in the 1980s fell 7.4 percentage points to 21.6 percent, a much larger decline than took at the national level. Moreover, in contrast to the national trend, the poverty rate of 1990s households was lower in 1997 than the poverty rate for 1980s immigrants was in 1989. The country of origin information at the bottom of Table 8 should be interpreted with some caution because of smaller size of the immigrant-related population. It is clear from the table, however, that Mexican households comprise roughly the same share of the total immigrant poor in the Midwest as they do at the national level. Poverty in the South. While the poverty rate for persons in immigrant households increased in the Northeast, Midwest, and West, this was not the case in the South. Immigrant-related poverty declined one half of one percentage point in this region from 22.8 to 22.3 (Table 10). However, this reduction was smaller than the 1.4 percentage point reduction for persons in native households. As a result, the gap between immigrant and native households increased somewhat in the 1990s, from 7.6 to 8.5 percentage points. This drop was caused exclusively by a decline in poverty in Texas from 34.3 to 28.7 (Table 12). If Texas is not included, then the poverty rate for persons in immigrant household in the South would have increased 2.4 percentage points between 1989 and 1997 instead of declining three tenths of a percentage point. In Florida, the other state in the South with a large population living in immigrant households, the poverty rate for persons in immigrant households increased 4.7 percentage points, from 17.6 to 22.3 percent. Moreover, despite a small drop in the poverty rate for persons in immigrant households in the South, the size of the immigrant-related poor population still increased 640,000, from 1.3 million to 1.94 million, while the size of the native poor population increased only slightly. As a result, immigrant households increased from 10 percent of total poor population to 14.1 percent during the 1990s. Moreover, immigrant households accounted for 640,000 or 87 percent of the total increase in the number of poor people in the South. The age data for the South show that child poverty continues to be a significant problem in the South for children in both immigrant and native households. While it remains high, however, the poverty rate for children in both native and immigrant households declined two-tenths of one percent in the 1990s. This left immigrant-related child poverty 8.6 percentage points or 42 percent higher than that of natives in both 1989 and 1997. Unlike the slow or non-existent progress of immigrant households in the Northeast or the more rapid progress out of poverty among immigrants in the Midwest, the year of entry data for the South show a pattern very similar to that of the nation. Immigrants start out with high poverty rates and make slow but steady progress. As is the case for the nation as a whole, poverty among 1990s immigrants in 1997 is somewhat higher than the poverty rate for 1980s households in 1989, indicating that new arrivals have a higher poverty rate now than in the past. Also similar to the nation, immigrant poverty in the South is highly concentrated among Mexican-headed households, which account for 48 percent of immigrant-related poverty. Poverty in The West. In comparison to other regions of the country, the West stands out for having the highest poverty rate associated with immigrants and the largest number of poor people in immigrant households (Table 11). The poverty rate of 24.6 percent for persons in immigrant households in 1997 was 2.3 percentage points higher than that of immigrants in the South, the region with the next highest immigrant-related poverty rate, and 50 percent higher than that of immigrants in the Midwest, the region with the lowest immigrant-related poverty rate. The 3.5 million persons in immigrant households living in poverty represent 46 percent of all immigrant-related poverty in the country. Perhaps most striking is the gap in the poverty rate for persons in immigrant and native households. In 1997, the poverty rate for individuals in immigrant households was 13 percentage points higher than that of individuals in native households; that is, the immigrant-related poverty rate was 121 percent higher. The West is the only region of the country were the poverty rate for persons in immigrant households is more than twice that of persons in native households. Moreover, while they represent only 24 percent of the total population in the West, persons in immigrant households accounted for 40 percent of the poor in 1997. Despite having the highest poverty rate for persons in immigrant households of any region in the country in 1989, immigrant-related poverty increased another 3.8 percent points during the 1990s. Only in the Northeast was the rise in immigrant-related poverty larger. California is by far the most important state in the region. In 1997, 79 percent of all persons in immigrant households in the West lived in California, and 47 percent of persons in native-headed households in the region lived in the state. Immigrant-related poverty in California is one of the highest in the nation at 24.4 percent (Table 12 ). However, California by itself does not explain the high poverty rate associated with immigrants in the region. In fact, the poverty rate in 1997 for immigrants in the West outside of California is 25.3 percent -- slightly higher than in California. However, the increase in the poverty rate in the 1990s for persons in immigrant households was larger in California than in the rest of the West. In 1989, the poverty rate in the West excluding California was 23 percent for persons residing in immigrant households and in California it was 20.4 percent. By 1997, immigrant-related poverty had increased in the non-California West to 25.3, a 2.3 percentage point increase, whereas it had grown to 24.4 percent in the Golden State a 4 percentage point increase. The state with the second-largest immigrant-related population in the West is Arizona. By 1997, the poverty rate for persons in immigrant households in Arizona was dramatically higher than in any other state. Even in 1989, Arizona was second only to Texas in the poverty rate for persons in immigrant households. Because of a drop in poverty in Texas and a rise in Arizona from 31.3 to 36.4 percent, the state gained the dubious distinction of having the highest poverty rate associated with immigrants of any state in the country (Table 12 ). Unlike California, where native poverty also increased over this period, in Arizona the poverty rate for persons in native households declined. Thus, the gap in the poverty rate for individuals in immigrant households is now more than twice as large in Arizona as in any other state in the country. Perhaps even more important, the number of people in poverty living in immigrant households in the state tripled in the 1990s from 113,000 to 330,000. And as a share of the total poor population, immigrant households more than doubled from 20.1 to 41.4 percent. Poverty among children in immigrant households is also more pronounced in the West than in other regions. Moreover, the problem has gotten worse in the 1990s. In 1997, 34.3 percent of children in immigrant households lived in poverty, up from 27.1 percent in 1989. As a proportion of children in poverty, those in immigrant households comprised 44.7 percent of children in poverty, a significant increase from 35.5 percent in 1989. Turning to the year of entry data, we see that although poverty is very high for immigrant households in the West, they do make some progress over time. However, progress out of poverty for immigrants in the West does not seem to follow the same pattern that exists at the national level. While poverty rates for persons in 1980s households had declined by 1997, their rate remained more than twice that of natives. Moreover, the poverty rate for 1970s and pre-1970s households did not decline at all between 1989 and 1997. Finally, as is the case in the Midwest and the Northeast, the poverty rate for 1990s immigrants is higher than was the rate for 1980s households in 1989. The country of origin data for the West show the importance of Mexican households. In 1997, Mexican-headed households accounted for 63.2 percent of immigrant-related poverty in 1997, significantly larger than their share (46.4 percent) nationally. While Mexican poverty is very high, however, a large proportion of non-Mexican immigrants also live in poverty. If Mexican households are excluded from the analysis, the high poverty rate for persons in immigrant households in the West would still be 16.9 percent, 46 percent higher than that of natives in 1997. Therefore, immigrants from Mexico only explain part of the poverty rate associated with immigrants in the western U.S. Poverty in New York and California. As has been pointed out, immigrants are very concentrated geographically. In 1997, the top eight immigrant-receiving states listed in Table 12 accounted for 77 percent of all persons in immigrant households, while accounting for only 43 percent of the nation's total population. California and New York in particular have extremely large populations living in immigrant-headed households. Together these two states account for almost half (46 percent) of all persons living in immigrant households in the United States. Tables 13 and 14 report more detailed poverty statistics for immigrants and native households in California and New York.18 There are a number of important similarities between the two states. The most obvious is a very high poverty rate for persons in immigrant households in both states. In 1997, the 24.6 percent poverty rate for persons in immigrant households in California was only 1.7 percentage points higher than New York's rate of 22.9 percent. However, this represents a significant change from 1989, when there was 4.3 percentage point difference between the two states. The size of the gap between the two states narrowed because, although the poverty rate for persons in immigrant households in California increased 4 percentage points (20 percent), it increased 6.8 percentage points (42 percent) in New York State. Both states also experienced an increase in poverty for persons in native households. However, the increase in native-related poverty was somewhat less (3.2 percentage points) in California, and significantly less in New York State (2.1 percentage points) than the increase associated with immigrants. As a result, the gap between immigrant and native households also increased in both states. While it is difficult to overstate the importance of these two states when examining persons in immigrant households, by themselves they do not explain the rise in immigrant-related poverty. If these two states are excluded, the poverty rate for persons in immigrant households would still have increased, although not as much, from 18.4 percent in 1989 to 20.0 percent in 1997. Thus, the high poverty rate associated with immigrants at the national level is not simply a result of high poverty among immigrant households in these two states alone. Turning to the gap between immigrant and native households nationally, it is clear that even if New York and California are excluded the gap is still very large. In 1997, the poverty rate for individuals in native households living outside of these two states was 11.8 and for persons in immigrant households outside of these two states it was 20.0. This means that if the two top immigrant states are excluded, immigrant-related poverty is 8.2 percentage points or 70 percent higher than that of natives in 1997 compared to 9.8 percentage points higher or 82 percent higher when New York and California are included. Therefore, 84 percent of the gap between the poverty rate for persons in immigrant and native households would exist even California and New York are excluded from the analysis. Turning to child poverty in Tables 13 and 14, we see that in both states poverty for persons under age 18 is increasingly an immigrant-related phenomenon. In 1989, 51 percent of all the children in poverty in California lived in immigrant households and this increased still further to 56 percent by 1997. In New York State, children in immigrant households accounted for 25 percent of all poor children in 1989 and this increased to 36 percent by 1997. Moreover, during the 1990s immigrant households accounted for 60 percent of the growth in the number of children in poverty in California and 57 percent in New York. While child poverty follows a similar pattern in both states, a very different pattern is found in the year of entry data. In particular, the pace of decline in poverty does not seem to be the same in both states. The poverty rate for 1980s households declined 3.5 percentage points (12 percent) between 1989 and 1997 in California. In contrast, the poverty rate for 1980s immigrant households in New York actually increased 6.2 percentage points or 26.5 percent over this period. As has already been pointed out, it is important to keep in mind that the same households are not being observed in 1989 and 1997. A household's composition as well as its head can change over time. Even so, the lack of economic progress for 1980s immigrants in New York is striking and suggests that a large percentage of this group lacks the skills necessary to compete successfully in the labor market. Another difference between California and New York is that the poverty rate for new arrivals seems to have deteriorated still further in California, while remaining about the same in New York. Turning to country of origin, we see that the primary difference between the two states is that Caribbean immigrant households account for a very large share of all immigrant households in New York (42 percent), while in California Mexican-headed households make up the lion's share of immigrant-related poverty (61 percent). There are also some differences between the two states for immigrants from the same region of the world. However, the small sample size for persons in immigrant-headed households from some regions means that the data should be interpreted with caution. It is better to use this data to make a determination of the relative differences between groups and not to see it as representing quantified absolute differences. Poverty by Metropolitan Areas. In addition to examining immigrant-related poverty by region of the country and state, it also possible to examine it in the nation's largest metropolitan areas. Because of the sample size in the CPS, however, immigrant poverty can only be analyzed in a few very large Metropolitan Statistical Areas (MSA). However, in it is possible to use combined metropolitan areas, referred to as Consolidated Metropolitan Statistical Areas (CMSA) by the Census Bureau, to examine the impact of immigration on the local level using the March 1998 CPS. In 1998 there were 18 officially designated CMSAs. Of these, 10 have a sufficiently large number of persons living in immigrant households to examine them using the CPS. Table 15 reports immigrant and native poverty for these CMSAs, along with the Phoenix MSA. The table shows that with the exception of the Washington-Baltimore CMSA, poverty associated with immigrants is higher than that of natives in every CMSA with a significant immigrant population. While higher than that of natives throughout the country, the poverty rate for persons in immigrant households varies significantly between cities. It ranges from a high of 37.1 percent for Phoenix (Houston's 27.3 percent is the highest of any CMSA) to Washington, D.C., where immigrant-related poverty was lower than that of natives in 1997. The gap between persons in immigrant and native households grew significantly in all but three cities during the 1990s. The gap increased in these cities primarily because the poverty rate for persons in immigrant-headed households increased. Only in San Francisco, Dallas, and Washington did immigrant-related poverty not increase. The largest percentage-point increase in immigrant-related poverty was in Phoenix, followed by New York, Los Angeles, Boston, Philadelphia, and Chicago. The findings in Table 15 confirm other data reported elsewhere in this study showing that the rise in immigrant-related poverty in the 1990s was very broad and resulted from an increase in immigrant-related poverty throughout most of the country and across demographic groups. As a share of total poor population in each CMSA, the highest percentage is found in Miami, where 69 percent of persons in poverty live in immigrant households, Los Angeles is next with 59 percent and New York is third with 44 percent of the poor living in immigrant households. In comparison, immigrant households in Miami account for 49 percent of the CMSA's total population, in Los Angeles the figure is 42 percent and in New York City immigrant households account for 30 percent of the CMSA's total population. Given their high poverty rate and large overall population, it is not entirely unexpected that immigrant households account for a very large share of the total poor population in areas like Miami or Los Angeles. However, Table 15 also shows that even in Philadelphia, which is not considered a major destination city for immigrants, almost one out of seven persons in poverty now lives in an immigrant household. Without a change in immigration policy, immigrant households will likely account for a growing share of the poor in cities like Philadelphia in the decades to come. 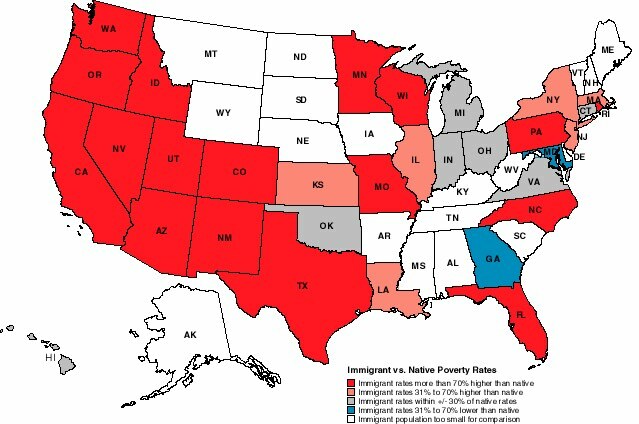 Immigrant Poverty by State. In addition to the regional, state, and local data in Tables Table 9, Table 10, Table 11, Table 12, Table 13, Table 14, Table 15, this study provides maps (located in the center section of the report) that illustrate the distribution of immigrant-related poverty across the country. While the CPS provides the most up-to-date information available, the sample size is not large enough to examine immigrant-related poverty in states with few immigrants. In order to overcome this problem, Map 1 is created by averaging the results of the March 1997 and 1998 CPS. By averaging two surveys, a reasonable estimate of immigrant and native poverty can be obtained in 32 states using the most up-to-date data available.19 Map 1 compares poverty rates for persons in immigrant households to persons in native households. It shows that in most states the poverty rate for persons in immigrant households is much higher than that of persons in native households. In only seven states, colored in grey, is immigrant-related poverty roughly equal to that of natives. And in only two states, shown in blue, is the poverty rate for persons in immigrant households substantially lower than that of persons in native households. In the remaining 23 states for which poverty comparisons are made, immigrant-related poverty is significantly higher than poverty associated with natives. These 23 states account for the overwhelming majority of the nation's total population living in immigrant households -- almost 90 percent in 1998. In contrast, those states where immigrant-related poverty is roughly equal to or lower than that of natives account for less than 10 percent of the total population living in immigrant households. While Map 1 shows the poverty rate of persons in immigrant households is much higher than that of a person in native household in most states, there are significant regional differences. The most dramatic feature of the map is the very high poverty rates for persons in immigrant households in the western states. This supports the findings in Table 11, which show that immigrant poverty in that part of the country is especially high. In contrast, in the Midwest immigrant-related poverty is roughly equal to that of natives in three of the eight states in the region for which comparisons are made. While these three states account for only a third of the population associated with immigrants in this part of the country, Map 1 supports the findings in Table 9, which shows that immigrant-related poverty is less of a problem in this region than in the rest of the country. As we have seen, the Midwest has the smallest population living in immigrant households of any region in the country, accounting for 10.6 percent of the national total in 1998. The fact that the poverty rate for persons in immigrant households is roughly equal to or lower than that of persons in natives households a few states shows that immigrant households do not necessarily have to have higher poverty then natives. Persons in immigrant households can have poverty rates that are roughly equal to that of natives. The primary reason for the difference in the poverty rates by state is the education level of persons in immigrant households. In states where immigrant poverty was more than 70 percent higher than that of natives, 39 percent of adults 25 and over in immigrant households lacked a high school degree. In states where immigrant-related poverty is 31 to 70 percent higher, 28 percent are dropouts. In contrast, in states where immigrant-related poverty is less than or roughly equal to natives, only 20 percent of adults in immigrant household are high school dropouts. Clearly, where education is the lowest, immigrant-related poverty is the highest. County by County Comparisons. While averaging two years of CPS data can provide reasonable estimates for about two-thirds of the states, the survey is not a large enough sample to provide reliable information on immigrant poverty at anything other than the state level, with the exception of the largest metropolitan areas (see Table 15). Only by using the decennial census is it possible to examine poverty at the local level for most areas of the country. The primary disadvantage to using the 1990 Census is that it is now nine years old. As we have seen, immigrant-related poverty has increased significantly since 1990. As a result, maps drawn using the census will tend to understate the poverty rate of persons in immigrant households. However, the Census does provide a great deal of useful data. Map 2, Map 3, Map 4 show the poverty rates for persons in immigrant households for counties in the United States.20 Counties with fewer than 50 persons living in immigrant households are excluded from the analysis and are shown in white in all three maps. Map 2 compares the poverty rates for persons in immigrant and native households using the same categories found in Map 1. Map 2 shows that in most counties, the poverty rate for persons in immigrant households is much higher than the poverty rate for persons in native households in the same county. This is especially true in areas of high immigrant settlement in the major immigrant-receiving states. In 1,331 or 53 percent of the 2,516 counties for which immigrant poverty is estimated, immigrant-related poverty is more than 31 percent higher than that of persons in native households. These 1,331 counties accounted for 71 percent of the total population living in immigrant households at the time of the Census. The 703 counties where immigrant-related poverty is roughly equal to that of natives account for 28 percent of the total population living in immigrant households. The 481 counties where immigrant-related poverty is at least 31 percent lower than that of natives account for 1 percent of the total population living in immigrant households. Thus, immigrant-related poverty is substantially higher than that of natives in most areas with a significant immigrant population. Only in those areas where few immigrants and their children live does the poverty rate associated with immigrants tend to be lower than or roughly equal to that of natives. 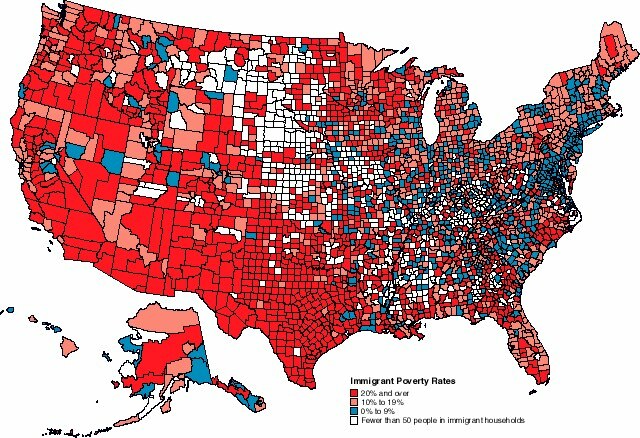 Map 3 shows the poverty rates for persons in immigrant households and no comparison to natives is made. While poverty among persons in immigrants households is high in many counties, it is important to realize that there are very few immigrant households in the vast majority of the nation's counties. In 1990, just 50 counties, located mostly in the nation's largest metropolitan areas, accounted for nearly 70 percent of the total population living in immigrant households. Thus, the rural counties that are such a prominent feature in a map of this kind, account for a very small share of the nation's immigrant population. In contrast the urban counties, where most immigrants and their children live, are geographically small and comparatively few in number. While the poverty rate for persons in immigrant households in comparison to natives and by themselves shown in Map 2 and Map 3 are important, the impact of immigration on a community is most dependent on the overall size of the population living in immigrant households. That is, even if immigrant-related poverty is very high in absolute terms or relative to natives, this will have little effect on a county if there are very few immigrant households in the county. Map 4 attempts to address this question by reporting the percentage of the poor in each county who live in immigrant households. Map 4 shows that for the most part, immigrants make up a large share of the poor in the western part of the United States, southern Florida, northern Illinois, the greater New York metropolitan area, and to a lesser extent in the Boston and Washington, D.C., areas. 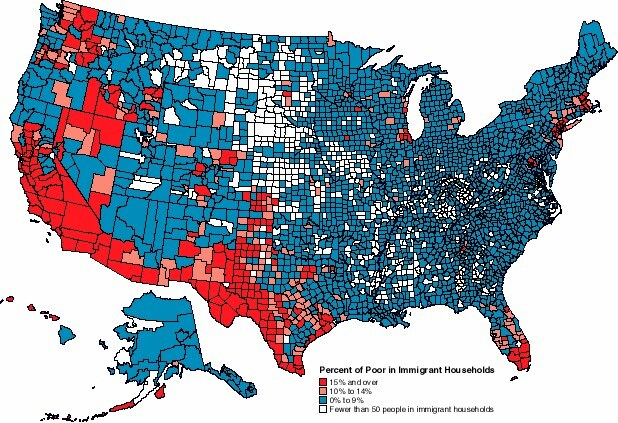 Outside of these areas, immigrant-related poverty was not a large problem at the time of census. If it were possible to generate such a map using more recent data, it would likely show that immigrant-related poverty has spread out from these areas and new pockets of immigrant poverty have emerged. However, the same basic pattern would remain, with immigrant poverty concentrated in the same areas of the country as it was at the time of the Census. The high concentration of immigrant poverty explains in part why elected representatives, primarily in Congress, have ignored this growing problem. Most members of Congress do not see immigrant-related poverty as an issue because there are few immigrants in their districts. where X is a vector of household level variables including nativity of head, education of head, size of household and other household characteristics; Z is a vector of individual level variables; and e is an error term. Table 16 provides brief descriptions of each of the variables used in the equation. The results of the logistic regression are presented in Table 17. The model does a reasonablely good job of predicting who is in poverty, predicting over 90 percent of the cases correcting. While this indicates very strong predictive power for the model, one must remember that since the national poverty rate at the time of the survey was 13.3 percent, guessing that an individual is not in poverty for every case (zero in the model) would be correct 86.7 percent of the time. In comparison, the model predicts poverty status correctly 90.3 percent of the time, a modest but not insignificant increase of 3.6 percentage points. Only the Head Female variable is statistically insignificant. All other variables are significant at the .001 level. The log-odds from the logistic regression reported in Table 17 are difficult to interpret. Therefore, it is necessary to calculate predicted probabilities for each variable in the equation to more easily interpret their impact on the propensity of an individual to be in poverty. One of the benefits of doing a logistic regression analysis is that it is possible to calculate the probability of an individual being in poverty given a certain set of characteristics. This can be done by holding all variables constant except for the variable of interest, and then varying that variable to determine its individual effect on the probability that a person will be in poverty. The probabilities reported in Table 18 are derived by varying only one variable at a time, all other characteristics, including those not reported in the table, are set to their mean value.22 The table can be interpreted as follows: Holding all other variables in the equation constant, an individual in an immigrant household has a .19 probability or 19 percent chance of being in poverty. In comparison, an individual in a native household has a .12 probability of being in poverty, again holding all other variables in the equation constant. This means that even after accounting for a wide variety of factors including, race, education, age, number of children in the household, and family structure, an individual in an immigrant household is about 50 percent more likely to be in poverty than a person in a native household. The predicted probabilities show that the effect of being in an immigrant household is similar in size to other factors often associated with a high risk of poverty. For example, the chance of being in poverty for persons in immigrant households is similar in size to the .21 probability that exists if an individual resides in a household headed by an unmarried female. This is also true for the labor force status of the household head. In the model, the probability of being in poverty for persons in a household with a non-working head is .20, almost the same as the .19 probability for persons in immigrant households. While it has received relatively little attention from researchers, this analysis indicates that being in an immigrant households increases significantly the risk that an individual will be in poverty. So far only one characteristic at a time has been varied; however it is possible to vary more than one variable simultaneously in order to better understand how factors interact with one another. This is potentially important because such factors as education, or marital status might have a different impact on persons in immigrant households than persons in native households. Table 19 reports probabilities when the immigrant variable and one additional variable is varied at the same time. As is the case with Table 19, all other variables are held constant by being set to their mean values. Thus, the table can be interpreted as follows: Individuals in a household headed by a native who is in the labor force have a 11 percent probability of being in poverty. The probability of being in poverty for persons in a household headed by an immigrant in the labor force is 17 percent. If we look at households headed by natives and immigrants not in the labor force, we see that the percent probability of being in poverty jumps significantly to16 percent for persons in native households and jumps even higher, to 25 percent, for persons in immigrant households. This means that the gap between persons in native and immigrant households increases from 6 percentage points when the head is in the labor force to 9 percent points when the head is not in the labor force. This suggests that not holding a job creates a greater risk of poverty among those in immigrant households than individuals in native households. Low levels of educational attainment also create a greater risk of poverty among persons in immigrant households than among those in native households. For example, if we look at poverty for persons in native and immigrant households by education level, we see that the gap between immigrants and natives is 11 percentage points for persons in households headed by dropouts but only 7 percentage points for persons in households headed by an individual with some college. Table 19 also shows that the same general pattern holds depending on the number of children in a household and if the household is headed by an unmarried woman. The more children in the household, the larger the difference between the poverty rates of natives and immigrants. For households headed by unmarried women, the gap is also substantially larger for persons in immigrant households compared to those in native households. The results in Table 19 should not be overstated. While the increase in the probability of being in poverty for persons residing in an immigrant household is significant, the growth in the size of the gap associated with changes in labor force status, education, number of children, and marital status cannot be described as extremely large. However, a pattern does seem to exist. Certain factors do seem to have a more deleterious effect on persons in immigrant households than those in native households, even when other variables are held constant. Overall the logistic regression and predicted probabilities indicate that the problem of immigrant poverty is very complex. Even after controlling for a wide variety of socio-demographic variables, the findings show that the chance of being in poverty for individuals in immigrant household is significantly higher than that of natives. It seems likely that factors such as unfamiliarity with their new country (in particular, its labor market), language barriers, cultural values, discrimination, and other factors lead to high poverty rates for immigrants and their dependents. Overcoming these problems takes time, and many immigrants are simply unable to do so. What's Different About Immigrant-related Poverty? When discussing the growth in poverty caused by immigration, it is important to keep in mind that it is different in one important respect from poverty caused by other societal trends such as changes in the economy or family structures. While the state can certainly do things to mitigate their impact, the move to an information-based economy, rising divorce rates, and out-of-wedlock births are complex social phenomena and are not the direct result of a specific government policy. In contrast, immigration is a discretionary policy of the federal government. By setting the level of legal immigration and the amount of resources it devotes to controlling illegal immigration, the federal government determines the size, growth, and characteristics of the foreign-born population. Thus, the poverty that results from immigration is preventable in a way that is not the case for poverty caused by domestic conditions. It seems reasonable therefore to argue that because the federal government created the problem in the first place, it has a much greater responsibility to address the problem than it has to address poverty caused by other factors. At the very least, Washington should provide much greater assistance to state and local governments, which now have to cope with a much larger poor population than would otherwise have been the case. Why Has the Problem Been Ignored? Part of the reason immigrant-related poverty has not attracted the attention of policymakers is that immigrant households did not represent a large proportion of the poor until about 20 years ago. Policy makers and researchers interested in poverty have generally focused on other issues, such as wages for low-skilled workers, changing family structure, discrimination, and the level of government benefits. And until recently, it was difficult to estimate the impact of immigration on poverty in United States. Only in 1994 did the Census Bureau began to ask a nativity question on regular basis as part of the CPS. Moreover, immigrants are not politically powerful. Many are not citizens and therefore cannot vote and most cannot afford to make campaign contributions. Thus, politicians could ignore immigrants in or near poverty without paying much of a political price. Also, as has already been pointed out, immigration is a discretionary policy of federal government. Elected officials in Washington are reluctant to deal with immigrant-related poverty because to do so would call attention to the fact that a conscious policy that they have either supported or at least not tried to modify has led to an enormous growth in the poor population. It is far easier for law makers to emphasize the positive aspects of current immigration policy and offer platitudes about “a nation of immigrants” than to deal with the problems they have created. Another important reason the dramatic growth in immigrant-related poverty has not received the attention it should have stems from the nature of the immigration debate. Most of the advocates for immigrants are also advocates for the current high level of immigration. These advocacy groups cannot call attention to immigrant-related poverty because to do so would highlight a fundamental problem with the very policy of high immigration they work so hard to defend. Thus, those who might be expected to push for greater efforts to help immigrants in or near poverty remain mostly silent. Costly new income support programs and efforts to increase the skills of immigrants so they can better compete in the labor market would undermine one of the arguments most often made by the advocates of high immigration, namely that it is an economic and fiscal benefit to the country. It would be much harder to make this argument if large sums of money are spent on welfare and other programs designed to increase the skills of immigrants. Therefore, in a very real sense, there is a conflict of interest between being an advocate for immigrants and an advocate for mass immigration. Advocates of immigration are trapped by their own rhetoric. As a result, little attention is paid to the millions of immigrants and their children who languish in poverty. While some may be tempted to ignore immigrant-related poverty at a time of relative prosperity, this seems very unwise. In just the last eight years, the size of the poor population increased by three million as a result of the growth in poverty among persons in immigrant households. If current trends continue, by the end of the next decade at least 10 million people residing in immigrant households will live in poverty, accounting for perhaps 30 percent of the nation’s total poor. Moreover, another six million persons in immigrant households will be near poor. The implications of this situation for the immigrants themselves, their children, and our society as a whole are such that we simply must confront this problem head on. It is my hope that this study will help policymakers, researchers, and all those concerned about poverty better understand the central role that immigration policy now plays in the perpetuation and growth of poverty in America. If we wish to continue to have an immigration policy that admits large numbers of unskilled persons, a large share of whom are likely to end up poor, then new programs must be developed with the intent of reducing poverty for immigrants and their children. Knowing that our immigration policy is causing poverty to grow significantly in the United States does not, of course, tell us exactly what we should do about this problem. Assuming that we are concerned about this situation, two sets of policy options would seem to make sense. The first and most obvious change is that a new immigration policy should be adopted that reduces the flow of immigrants likely to end up in poverty. It makes little sense to have an immigration policy that dramatically grows the poor population. This is especially true when one considers that with the exception of refugees, immigration is supposed to benefit the United States. As has already been pointed out, an estimated 10 million immigrants will arrive in just the next decade without a change in immigration policy. If the same selection criteria continue to be used, a large percentage of these immigrants along with their U.S.-born children will very likely end up in poverty. Therefore, to ensure that this problem does not continue into the indefinite future, changes in immigration policy are clearly warranted. The second set of policy options to deal with this problem would involve the development and implementation of policies that address the needs of low-income immigrant households already here. This would have to be done in the context of existing anti-poverty programs and it would have to be designed to meet the specific needs of immigrant households in poverty. It would also have to take into account a political environment that at present is very skeptical of costly new programs designed to uplift the poor. Because the research presented here indicates that low levels of educational attainment are one of the primary reasons for the very high poverty rates associated with immigrants, selecting more immigrants based on their skills would reduce poverty among immigrants who arrive in the future. This would require changes in both the selection criteria for legal immigrants and significantly stepped-up efforts to reduce illegal immigration. Let us consider changes to legal immigration first. In most years, 65 to 70 percent of visas are allotted to the family members of U.S. citizens and Lawful Permanent Residents (LPRs). Family relationships could continue to be a central part of immigration policy; however, by limiting which relatives are eligible for admission we could reduce the number of immigrants admitted without regard to their skills or ability to compete in the modern American economy. The Commission on Immigration Reform chaired by the late Barbra Jordan suggested limiting family immigration to the spouses, minor children, and parents of citizens and the spouses and minor children of LPRs. This would eliminate the preferences now in the law for the siblings and adult children (more than 21 years of age) of citizens and LPRs, thereby significantly reducing the number of immigrants selected without regard to their skills. The preference for the spouses and children of non-citizens should also probably be eliminated, since these provisions apply to family members acquired after the alien has received a green card, but before he has become a citizen.23 If the parents of citizens were also eliminated as a category, family immigration would be lowered to roughly 300,000 per year, and the number would likely fall to 200,000 in a few years. Humanitarian immigration should also undergo some changes. A greater effort should be made to limit asylum and refugee status to those who are genuinely in need of permanent resettlement because of persecution or a well-founded fear of persecution. The expansion of asylum grounds to groups not originally intended is likely to undermine public support for this small but needed category of admission. Abuse of the asylum law also encourages illegal immigration by allowing those who make it into the United States to claim asylum on specious grounds in an effort to forestall deportation. As for refugees, the system must continue to remain flexible and in some years it may need to expand beyond the 50,000 originally intended by the Refugee Act of 1980. Limiting resettlement to 50,000 would still allow the United States to take in all of the persons identified by the U.N. High Commissioner for Refugees as needing permanent resettlement. At present, refugee policy is highly politicized and relatively few of the refugees admitted to the United States meet the internationally accepted definition of a refugee. For employment-based immigration, the most important change would be to drop the 10,000 visas for unskilled workers24. In addition to allowing in unskilled immigrants, this category also encourages illegal immigration because it offers the hope to unskilled illegal aliens that they will find an employer who will eventually petition to bring them in legally. While the number of illegal aliens that actually are able to take advantage of this provision is small, it does offer the hope of legal status to illegal aliens. The Jordan Commission has also suggested eliminating the visa lottery. While the lottery represents 6 to 8 percent of the legal immigrant flow, it makes little sense to admit immigrants based on luck. It also stimulates further family immigration because the winners can then petition to bring in brothers and sisters, adult children, and parents. Restricting family immigration to only the spouses and minor children of U.S. citizens, rationalizing humanitarian immigration and ending the lottery would significantly reduce the number of legal immigrants admitted each year without regard to their ability to compete in the U.S. economy. This would ensure that immigration does not continue to cause a substantial increase in poverty into the indefinite future. As we have seen, most of the people living in immigrant households in poverty are legal immigrants or the U.S.-born children of immigrants; however, reducing illegal immigration would still be helpful in reducing immigrant-related poverty. Illegal immigration is undoubtedly the lowest-skilled immigration, with an estimated poverty rate of 37 percent. Among those who study the issue, there is broad agreement that cutting illegal immigrants off from jobs offers the best hope to reducing illegal immigration. Since 1986 it has been unlawful to employ illegal aliens. However, to date, worksite enforcement efforts have been ineffective. There are three steps that are needed to make worksite enforcement more effective. First, a national computerized system that allows employers to verify that persons are legally entitled to work in the United States needs to be implemented. Tests of such systems have generally been well received by employers (Bolton, 1999). Second, the INS must significantly increase worksite enforcement efforts. Congress has repeatedly failed to increase funding for worksite enforcement, even though the INS continues to ask for more agents. Third, more could also be done at the border. Despite increases in funding over the last few years, efforts along the southern border remain grossly inadequate. The INS estimates that 60 percent of the illegal aliens in the United States have crossed the border illegally — the other 40 percent are visa over-stayers (Statistical Yearbook of the Immigration and Naturalization Service, 1997). A real effort to control the border with Mexico would require perhaps 20,000 agents and the development of a system of formidable fences and other barriers along those parts of the border used for illegal crossings. The cuts in legal immigration proposed earlier would also go a long way toward reducing illegal immigration in the long run, because the current system of legal immigration creates a strong incentive to come illegally. There are approximately 4 million people qualified for immigration to the United States but who are waiting their turn to receive the limited number of visas available each year in the various family categories. Such a system encourages those who have been selected, but have to wait, to simply come to the United States and settle illegally in anticipation of the day they are granted visas. Eliminating the sibling and adult children categories would alleviate this situation by doing away with the huge waiting lists. In addition to reducing the incentive to come before a green card is issued, cuts in legal immigration would also be very helpful in controlling illegal immigration because communities of recent immigrants serve as magnets for illegal immigration, providing housing, jobs, and entree to America for illegals from the same country. It is no coincidence that the top immigrant-sending countries are also the top countries sending illegal immigrants to the United States. Sociological research shows that one of the primary factors influencing a person's decision to emigrate is whether a family member or member of their community has already come to United States (Massey and Espinosa 1997; Palloni, Spittel and Ceballos 1999). Thus, allowing in large numbers of legal immigrants is one of the causes of large scale illegal immigration. The changes in legal and illegal immigration policy outlined above would restore immigration levels to their historical average of about 300,000 to 400,000 annually in a few years. Even with these changes, the United States would continue to accept two or three times more immigrants than any other country. While lowering the number of less-skilled legal and illegal immigrants entering each year would ensure that fewer new immigrants end up in poverty, it would not lift immigrants and their children currently residing in the United States out of poverty. The most direct and simplest way to reduce poverty for persons in immigrant households would be to increase the dollar value of means-tested cash programs designed to assistant persons in or near poverty. If the increase was large enough, it could dramatically reduce the number of people living below the poverty line. The primary disadvantage of programs of this kind is the cost. An increase in income transfer programs of sufficient size to have an appreciable effect on the number of people in poverty would cost tens of billions of dollars. For example, in 1996, federal expenditures on means tested cash assistance programs cost $86 billion.25 According to estimates done by the Census Bureau, these programs reduce the number of people in poverty by only 2.6 million in 1997 (Dalaker and Naifeh 1998). The fiscal costs associated with a dramatic increase in spending on cash assistance program creates a political obstacle that at the present time seem insurmountable. Such proposals are seen as only "throwing money" at the poor. Reflecting this political reality, after touring poverty-stricken areas of the country in July of this year, President Clinton did not even mention cash assistance programs as a way of reducing poverty. Instead, he made a few modest proposals designed to increase private investment in these areas and called on business leaders to voluntarily locate in low-income parts of the country. While dramatic increases in income transfer programs are off the table politically for the time being, it may be possible to restore immigrant eligibility beyond what has already been done. However, restoring benefits to immigrants that were cut as part of welfare reform in 1996 should be seen as a matter of fairness and not as an effective anti-poverty measure because, as we have seen, welfare reform did not increase immigrant-related poverty. Therefore, restoring benefits is unlikely to significantly reduce poverty for persons in immigrant households. Because one has to work to receive benefits, the Earned Income Tax Credit (EITC) is one means-tested income transfer program that has considerable political support. Increasing the value of this program would certainly be helpful to the nearly 5 million persons living in an immigrant household where at least one person works. Of course, this program is also costly. In 1996, expenditures on the EITC were $22 billion (Statistical Abstract of the United States: 1998). Moreover, the EITC only helps persons in the labor force, so it would have no effect on the 2.7 million persons living in an immigrant household in which no one works. Another area where new initiatives may be possible is job retraining. Since the low skill levels associated with immigrants is one of the primary reasons so many are in poverty, increasing the ability of immigrants to compete in the labor market by improving their job skills would certainly be helpful in reducing their poverty rates. Subsidized child care may also assist immigrant parents in joining the work force. The statistical model showed that the more persons employed in the household, the lower the risk of poverty. Therefore, increased subsidies for child care may be helpful in increasing the number of adults in immigrant households who work. In addition, since immigrants tend to have more children than natives and the logistic regression model showed that larger family size creates a greater risk of poverty for immigrant households than native households, perhaps greater access to family planning may be helpful in lowering the poverty rate for immigrants and their children. Finally, specific programs designed to increase immigrant familiarity with their new country may reduce poverty among immigrants. This may include adult education programs designed to increase knowledge of English, the U.S. job market, and services available from government and private sources. 1 In this paper the term poor is used to mean persons living below the poverty threshold. 2 Unrelated individuals under age 15 who are mostly foster children are not included in most official poverty statistics and they are not included in this study. 3 While there are many criticisms of this official definition, most observers agree that persons living below the poverty line are quite poor by American standards. For a brief discussion of the advantages and disadvantages of our current definition see Devine and Wright (1993). 4 By itself this does not mean that immigrants are a net drain. But a report published by the National Research Council in 1997 found that at the present time the net drain on public coffers (tax revenue minus services used) caused by immigrant households was between $11 billion and $22 billion a year (Edmunston and Smith, 1997). The high rate of immigrant poverty is partly responsible for this fiscal drain. 5 The 1 percent public use sample is used for analysis of metropolitan statistical areas. 6 For the 1980 Census, the study uses a 60,000 person sample drawn from the Integrated Public Use Microdata Series provided by the University of Minnesota. 7 These figures are for the 1998 CPS. 8 These figures are only for primary family members, as defined by the Census Bureau. Individuals in subfamilies along with those not in a family, such as persons living alone, are not included in these statistics. Such persons are included in all other poverty statistics reported in this study. 9 These numbers are based on the author's tabulations of March 1996 CPS. 10 Additional information provided by Dr. Jeffrey Passel of the Urban Institute in personal communication, July, 12 1999. 11 These results also mean that the poverty rate for persons in immigrant households who are not illegal is 19.6 percent. While this is somewhat lower than the poverty rate of 21.8 percent when illegal aliens are included, it is still 63 percent higher than the 12 percent for persons in native households. 12 It is important to keep in mind that the same households are not being observed in 1979, 1989 and 1997. Moreover, the general characteristics of household composition changes for each cohort over time. Even so, a clear pattern does emerge from comparing cohorts over time. 13 It is important to keep in mind that these calculation exclude poverty among persons under age 25. 14 Comparisons cannot be made between the Census and CPS for the American Indian/other category because "other" is not a choice on the CPS. Since this response is only possible in the Census, the figures from 1997 are for only American Indians. 15 Persons are considered of working age if they are at least 15 years of age. 16 This report uses the standard Census Bureau definition of geographic regions of the country. The Northeast region includes: Maine, New Hampshire, Vermont, Massachusetts, Connecticut, Rhode Island, New York, New Jersey, and Pennsylvania. The Midwest includes: Ohio, Indiana, Illinois, Michigan, Wisconsin, Minnesota, Iowa, Missouri, North Dakota, South Dakota, Nebraska, and Kansas. The South includes: Delaware, Maryland, Washington D.C., Virginia, West Virginia, North Carolina, South Carolina, Georgia, Florida, Kentucky, Tennessee, Alabama, Mississippi, Arkansas, Louisiana, Oklahoma, and Texas. The West includes Montana, Idaho, Wyoming, Colorado, New Mexico, Arizona, Utah, Nevada, Washington, Oregon, California, Alaska, and Hawaii. 17 Proportionately, the increase in New Jersey in immigrant-related poverty was much larger than in New York State. 18 The very large sample size in the CPS in these two states allows for a more detailed examination of immigrant-related poverty that is possible in other states. 19 Comparisons are only made in the 32 states with more than 100,000 persons residing in immigrant households at the time of the March 1998 CPS. 20 The original census data for counties were drawn from 1990 Census Summary Tape File 4 tabulations of poverty status by nativity for families and unrelated individuals (Tables 108 and 120). To show poverty for the total population in counties regardless of whether they were living in a family, it was necessary to combine the two tabulations. (Persons in families, are by definition, related to the household head) Since the tabulations for families do not specify how many people are in each family, an analysis of PUMS data was used to create factors to translate numbers of families into their corresponding numbers of persons. First, the average family size was tabulated for families above and below poverty according to the nativity of the head and state of residence. These four average family size figures per state (above and below poverty for persons in families in native and immigrant families) were then multiplied by the corresponding counts of families based on the nativity of the head in each county of every state. This yielded counts of persons in immigrant and native headed families by poverty status for all counties. Adding these counts of persons in families to the counts of unrelated individuals using their individual nativity yielded the final data used to generate Maps 2, 3 and 4. While not exactly the same as the method used in the rest of the study, combining tables from the summary tape files in this way comes as close as possible to matching the definition of immigrant and native households used to create the tabulations found in Tables 1 though 15 and Map 1. 21 The same definition of household is used in the logistic regression as in tabulations reported in Tables 1 through 15. 22 The dummy variables in the model are set at .5. 23 There is currently a large backlog of persons waiting to enter in the spouses and minor children of Lawful Permanent Residents category. A significant portion of these individuals are the family members of IRCA amnesty beneficiaries. It seems unwise to continue to separate these families. Therefore, it would make sense to grandfather in those already on the waiting list. However, no future applications would be taken for the spouses and minor children of LPRs. 24 In 1997 unskilled employment-based immigration was temporally lowered to 5,000 to offset amnesty given some illegal aliens from Central America. It will remain at this level until all those eligible have adjusted to legal status. 25 1996 is the most recent year for which data is available. This figure is from the Statistical Abstract of the United States: 1998 and does not include cash assistance for foster care or the EITC. Bolton, Nancy. Employment Verification Program Survey. Forthcoming 1999. Center for Immigration Studies. Borjas, George J. 1994. "The Economics of Immigration." Journal of Economic Literature 32 (4): 1667-1717. Blank, Rebecca M. 1991. "Why Were Poverty Rates So High in the 1980s?" National Bureau of Economic Research, Working Paper No. 3878. Cambridge, Mass. : NBER. Camarota, Steven A. 1999. "Immigrants in the United States 1998: A Snapshot of America's Foreign-born Population" Backgrounder 1-99. Washington, D.C.: Center for Immigration Studies. Clark, Rebecca L. and Jeffrey Passel. 1998. Identifying Legal and Illegal Immigrants in the Census and Current Population Surveys: A New Technique Based on the Occupational Distribuion of Illegal Aliens. Washington D.C.: Urban Institute. Dalaker, Joeseph and Mary Naifeh. 1998. Poverty in The United States: 1997. U.S. Bureau of Census, Current Population Reports, Series P60-201, U.S. Government Printing Office, Washington, D.C.
Devine, Joel A., and James D. Wright. 1993. The Greatest of Evils: Urban Poverty and the American Underclass. New York: Aldine De Gruyter. Edmonston, Barry and James Smith, ed. 1997. The New Americans: Economic, Demographic, and Fiscal Effects of Immigration. Washington D.C.: National Academy Press. Gasiorowski, Mark and Timothy Power. 1998. "The Structural Determinants of Democratic Consolidation: Evidence from the Third World." Comparative Political Studies 31: 740-771. Hanratty, Maria J. and Rebecca M. Blank. 1992. "Down and Out in North America: Recent Trends in Poverty Rates in the United States and Canada." Quarterly Journal of Economics, February. p.233-254. Harrison, Bennett and Barry Bluestone. 1988. The Great U-Turn: Corporate Restructuring and The Polarizing of America. New York: Basic Books. Legal Immigration, Fiscal Year 1997. January 1999. Immigration and Naturalization Service, Press Release. Office of Policy and Planning, Statistics Branch. Lipset, Seymour Martin. 1959. "Some Social Requisites of Democracy: Economic Development and Political Legitimacy." American Political Science Review 53: 69-105. Massey, Douglas S., and Kristin E. Espinosa. 1997. "What's Driving Mexico-U.S. Migration? A Theoretical Empirical, and Policy Analysis". American Jouranal of Socialogy 102: # 4 939-999. Mishel, Lawrence, Jared Bernstein and John Schmitt. 1998. The State of Working America: 1998-1999. Cornell University Press. Statistical Abstract of the United States:1998 (118th edition.) Washington, D.C.: 1998. U.S. Bureau of the Census. Palloni, Alberto, Mike Spittel and Miguel Ceballos. 1999. "Using Kin Data to Falsify Social Networking Hypotheses in Migration." Paper presented at the annual meeting of the Population Association of America. Rueschmeyer, Dietrich, Evelyne Huber Stevens, and John Stevend. 1992. Capitalist Development and Democracy. Chicago: University of Chicago Press. Warren, Robert. 1999. "Unauthorized Immigrants Residing in the United States: Estimating the Populations, Components of Change, and Trends, by Broad Area of Origin, 1987 to 1997." Paper presented at the annual meeting of the Population Association of America.